A few weeks ago I made my first batch of ricotta cheese! It was so much easier than I thought it would be. The recipe is from Fine Cooking. Thanks to the use of whole milk and cream it is rich and luscious. While I am sure it would take your lasagna to the next level, I wanted to use it in a way that allowed it to really be showcased, not masked behind tomato sauce and heavy meats. 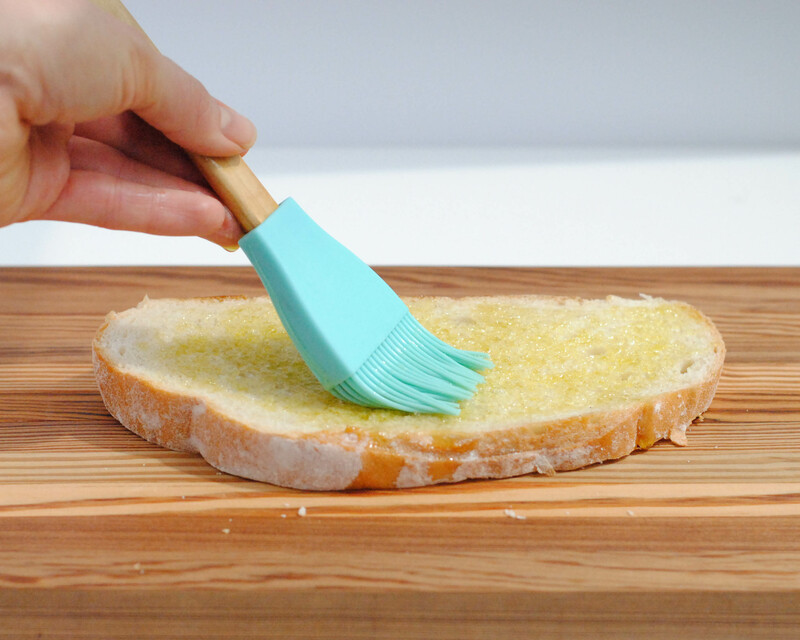 These toasts were the perfect way to use it. Many ideas I came across for ricotta toasts were sweet with ingredients like honey, figs, strawberries and grapes. I wanted something that would qualify as dinner, so I decided on roasted asparagus with lemon and thyme and tomato and basil. This will definitely be something I’ll make again this summer, it’s light but still satisfying. 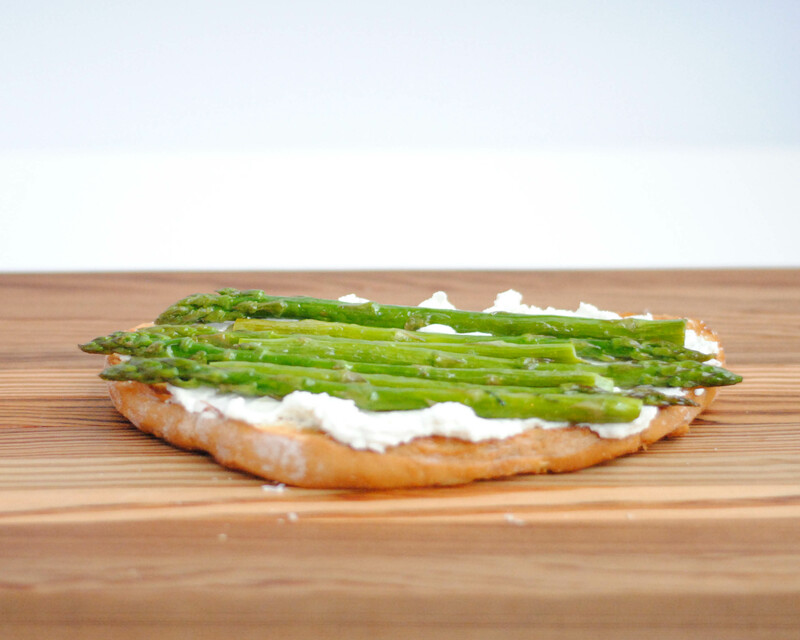 I can also see adapting this to serve as an appetizer or as part of a brunch. I’m helping host a baby shower in a couple months, and I think these would be perfect. Top with a tablespoon or 2 of the ricotta. 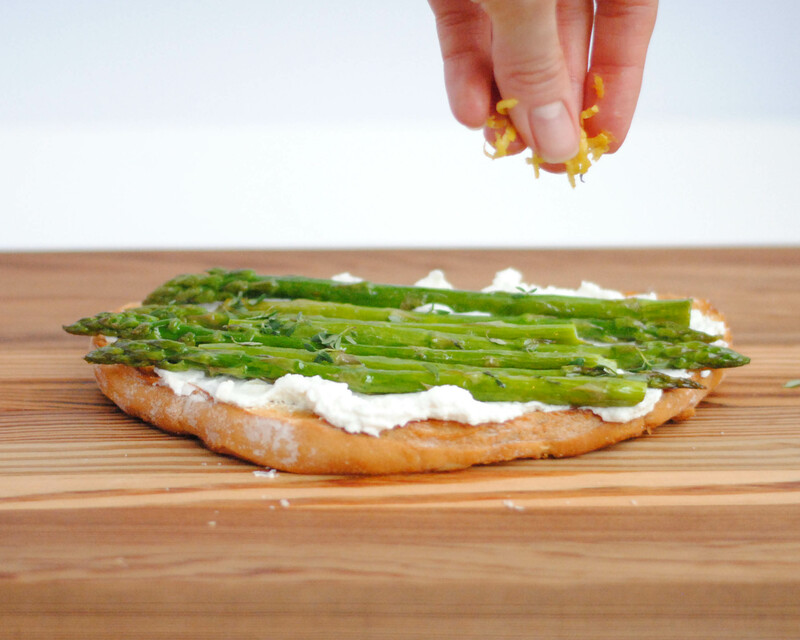 Layer on some roasted asparagus. Sprinkle with fresh thyme and lemon zest, and maybe a bit of salt. I also made some with slices of fresh tomato, chopped fresh basil and some sea salt. I will never tire of that combination. 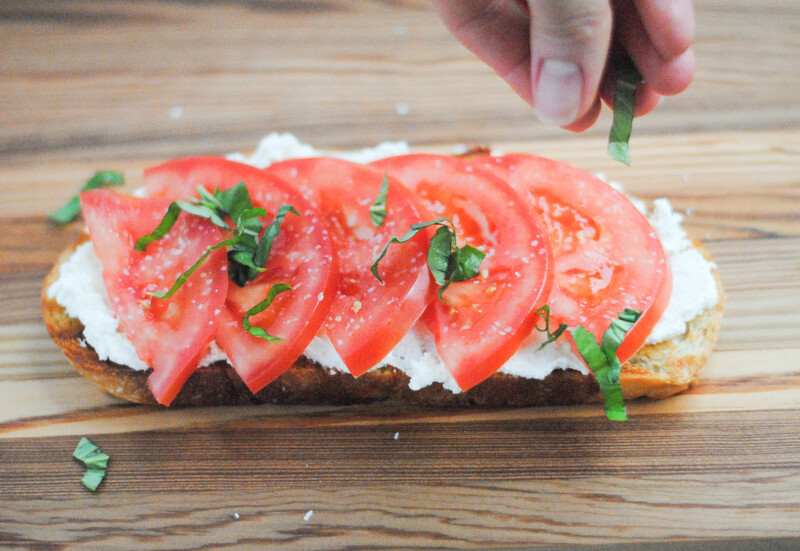 And it’s perfect for summer when fresh basil and ripe tomatoes are in abundance. 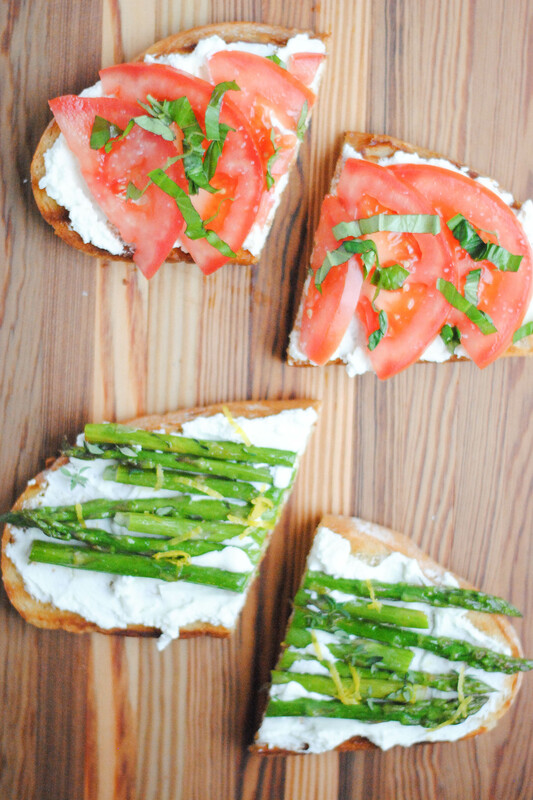 Do you have any great toppings for ricotta toasts? I’d love to hear what you’ve tried! Fold cheesecloth to make 3 or 4 layers, wet and then squeeze the excess liquid out. Line a colander with the cheesecloth and set in a clean sink. Put the milk and cream in a large pot. Clip a candy thermometer to the side of the pot and slowly warm the milk and cream over medium-low heat, stirring occasionally, until it’s 185°F, about 20 minutes. Remove from the heat, stir in the salt, and then slowly pour the lemon juice over the surface of the milk. 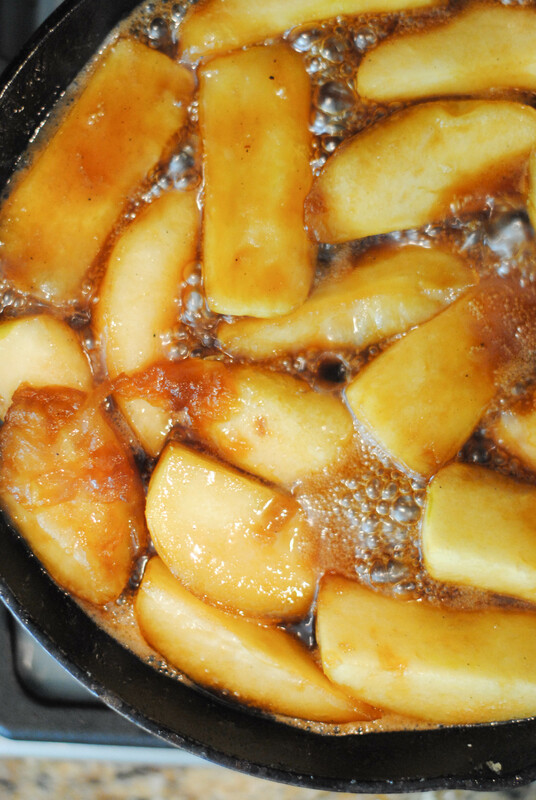 Once all of the lemon juice has been added, stir gently for 1 to 2 minutes to encourage curds to form. Gently ladle the curds into the prepared colander. Fold the ends of the cheesecloth over the curds to loosely cover. Drain until it reaches your desired consistency, 30 minutes for a soft ricotta and up to 24 hours for a very firm, dry, dense ricotta. 30 minutes to an hour created the consistency I liked for the toasts. Be sure to refrigerate if draining the ricotta for more than a couple of hours. 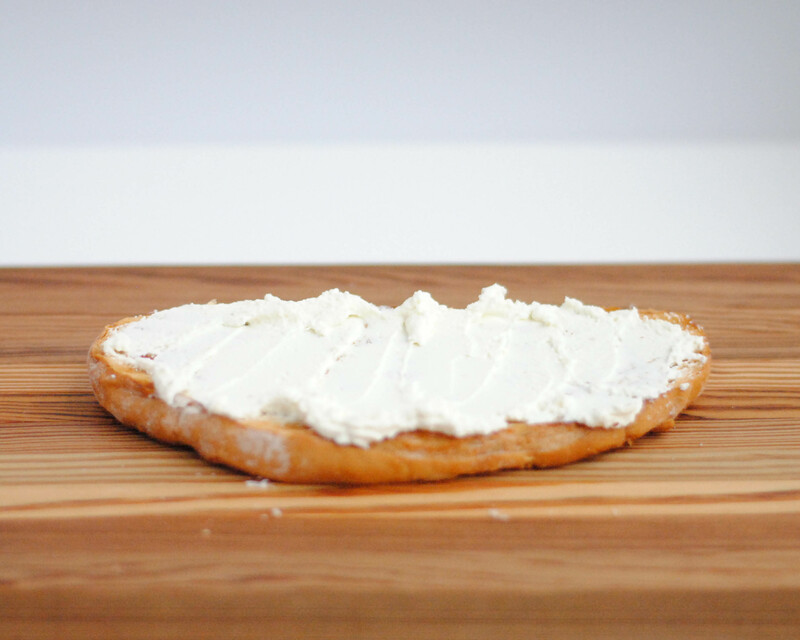 Transfer the drained ricotta to an airtight container and refrigerate for up to 3 weeks. 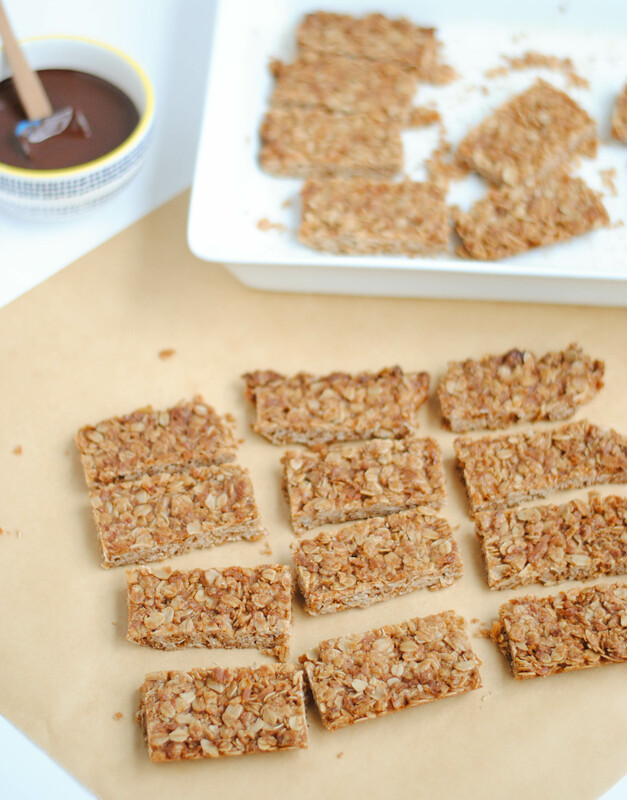 The last post on Hottie Biscotti was the April Daring Bakers challlenge. A full month of no posts! I know you’ve been wondering just what has happened to me. Well, I have just been doing a poor job of keeping up with the blog. Honestly I don’t know when I would’ve posted next if I didn’t have a commitment to keep up with The Daring Bakers. Blogging has taken a back seat lately. Being a mom is a lot of work and sometimes (or a lot of the time this past month) sitting down and watching TV during nap time is more valuable and enjoyable to me than taking photos or writing a blog post. Anyone else have dry spells in blogging? Anyway, I was glad to have this fun challenge to get me back here. 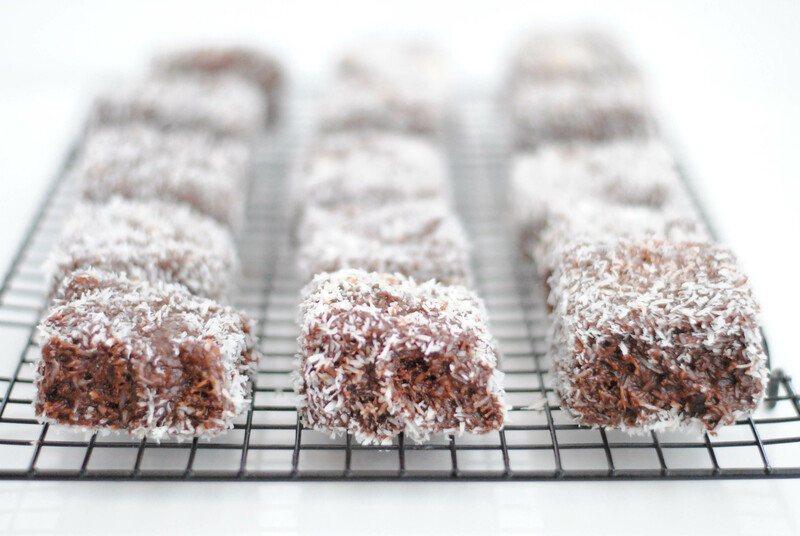 I’d never seen or heard of Lamingtons before. I’d never even made a sponge cake! So, thanks for the great challenge, for having me try something new, and for getting me to blog, Marcellina! 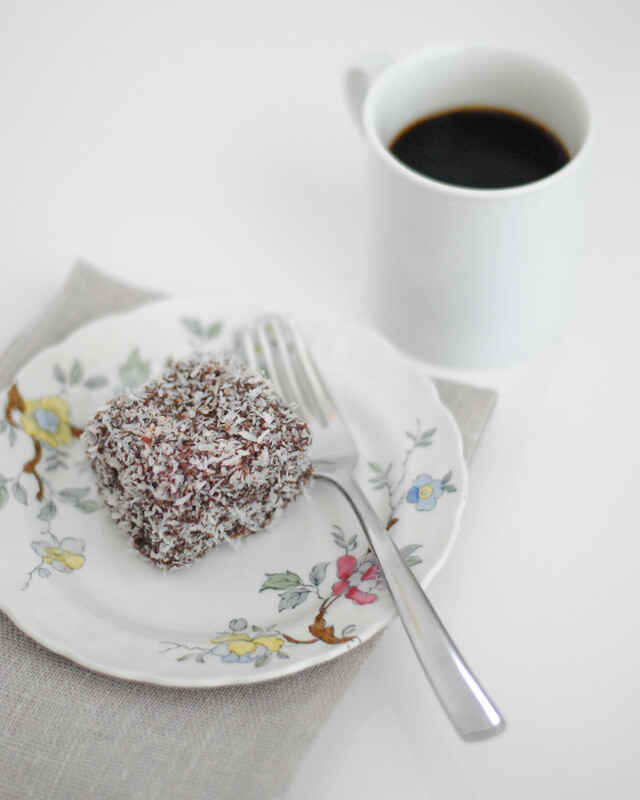 I ate one of these with my afternoon coffee today and loved every bite of it. 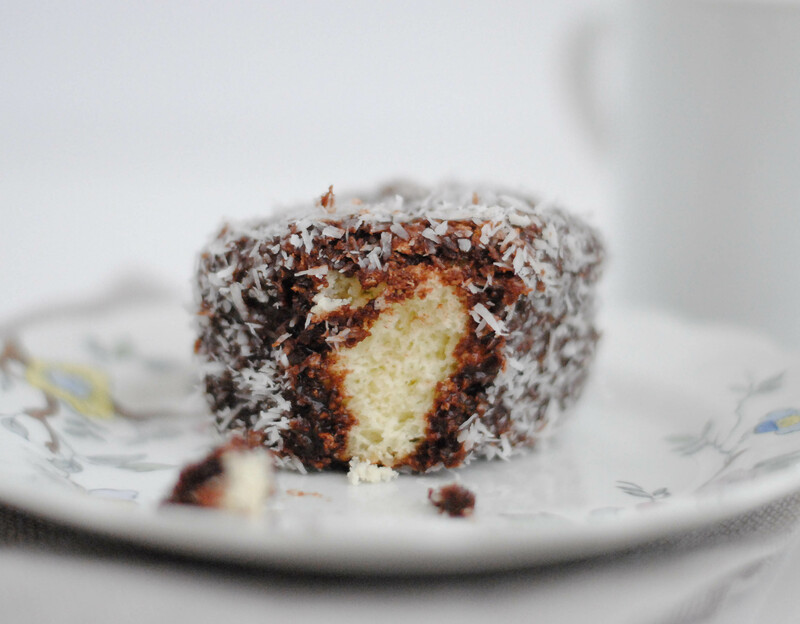 The delicate cake with the thin layer of chocolate and slightly crunchy coconut made for a really special treat. 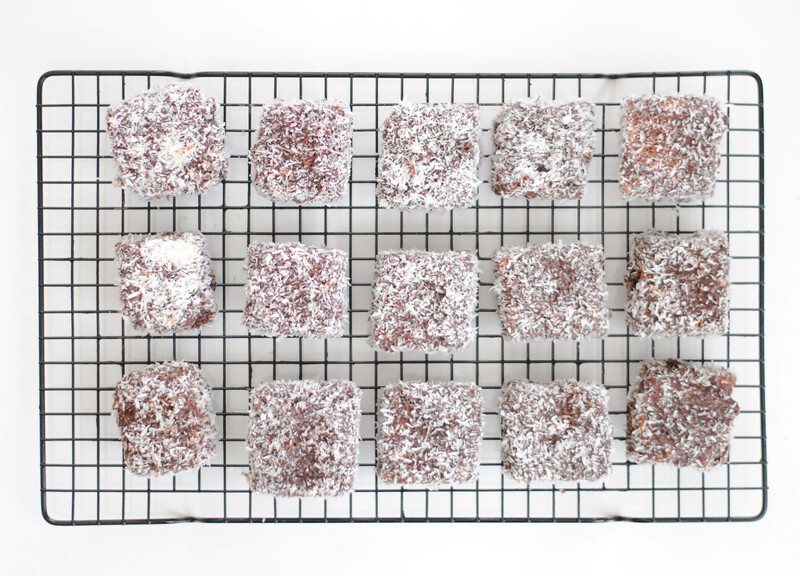 It’s basically a Mounds bar in cake form, so if you like those you should have no problem liking Lamingtons. 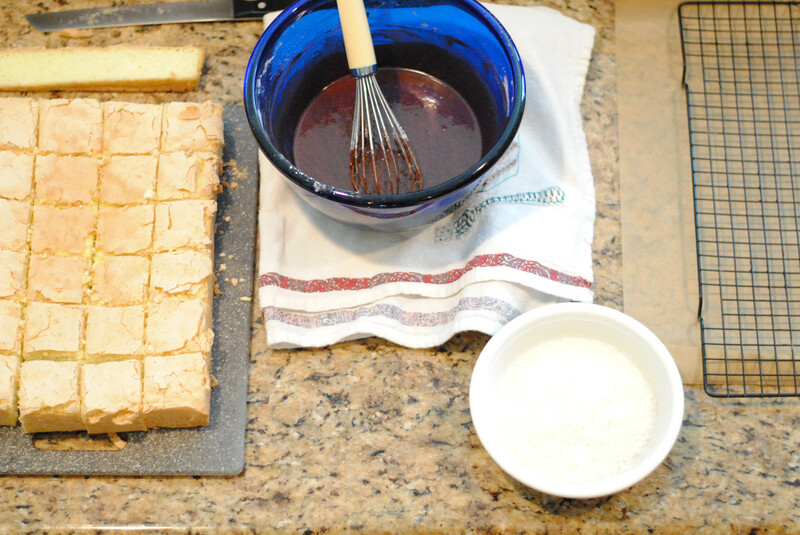 Making the sponge cake is fairly simple when it comes to ingredients and baking, but it is tedious. Having a stand mixer is super helpful since you beat the eggs and sugar on high speed for 15 minutes. I was thankful to be able to turn on the timer and tend to other things while my mixer did all the work! 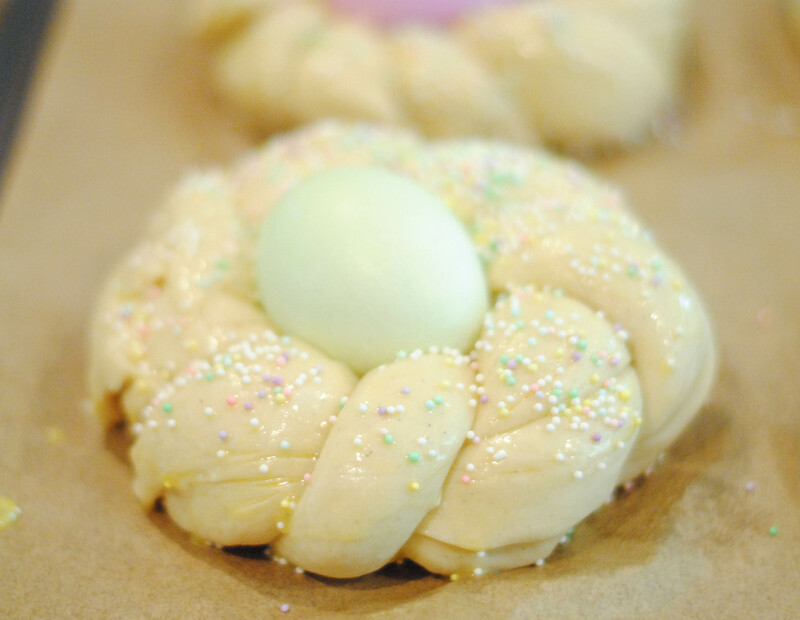 When you fold in the flour mixture it’s important not to deflate the eggs, but you also want to get all the flour incorporated, so there’s a delicate balance. 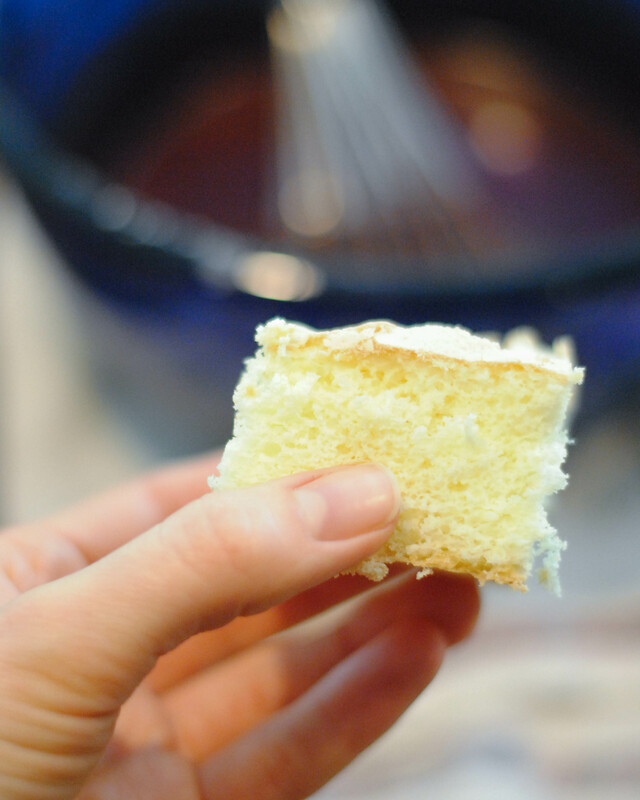 I don’t think that I achieved a perfect sponge, there were a few little pockets of unmixed cornstarch and baking powder in one part of the cake, but overall the flavor was incredible and the texture was light and airy. And I don’t know what truly proper sponge cake should be like, so maybe mine was nowhere near acceptable. But it worked! So I’m going to call it good. Here is my set up for dipping and coating the cake. Doesn’t it look neat and clean? 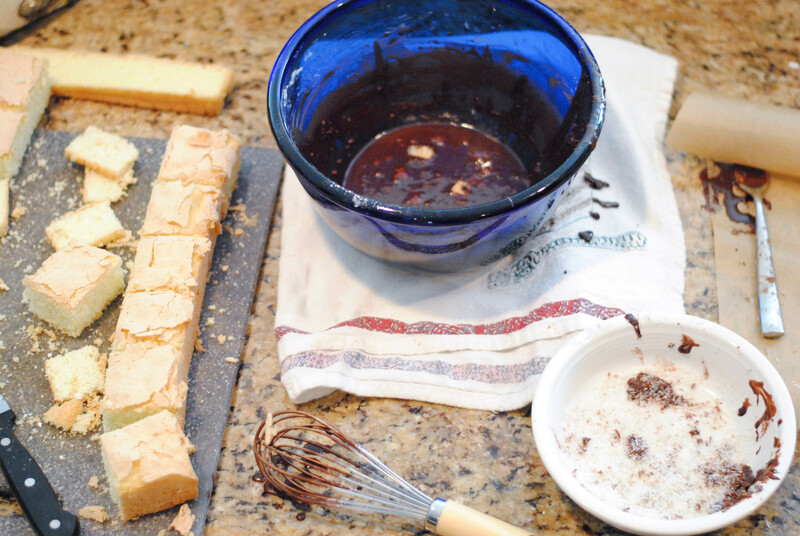 The chocolate glaze is delicious, a breeze to mix up, and easy to work with, at least at first. 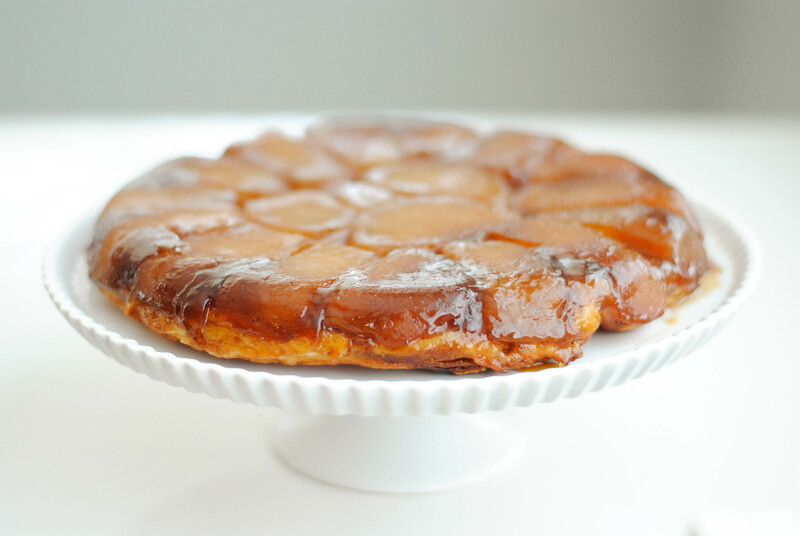 The only problem I ran in to glazing and coating the pieces in coconut was that the delicate cake lost little pieces in the chocolate which, after about a dozen pieces of cake, made for a yucky mess that was no longer easy to work with. So I ended up not even bothering to coat all the pieces. My kids gladly ate the extra cake for dessert and felt very fancy. If I really needed to coat them all I’d make a second batch of glaze that I could switch to once the first batch became not so wonderful. Here is the mess I made. But here is what came out of all that mess. Totally worth it. 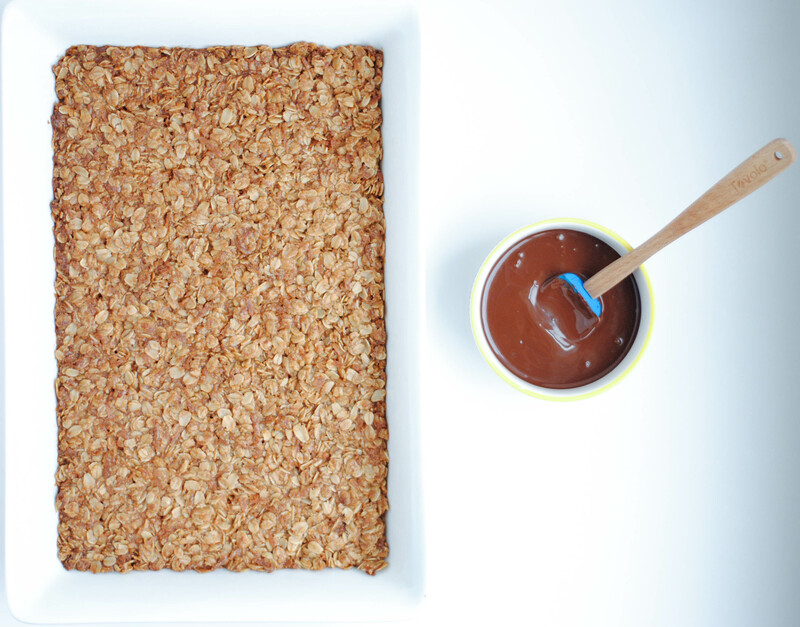 Prepare a 4 ½ cm (1¾ inch) deep 9”x 13” baking pan by lining with non-stick paper and greasing the paper. In a stand mixer bowl place eggs, sugar and salt. Using the whisk attachment, beat on high for 15 minutes. 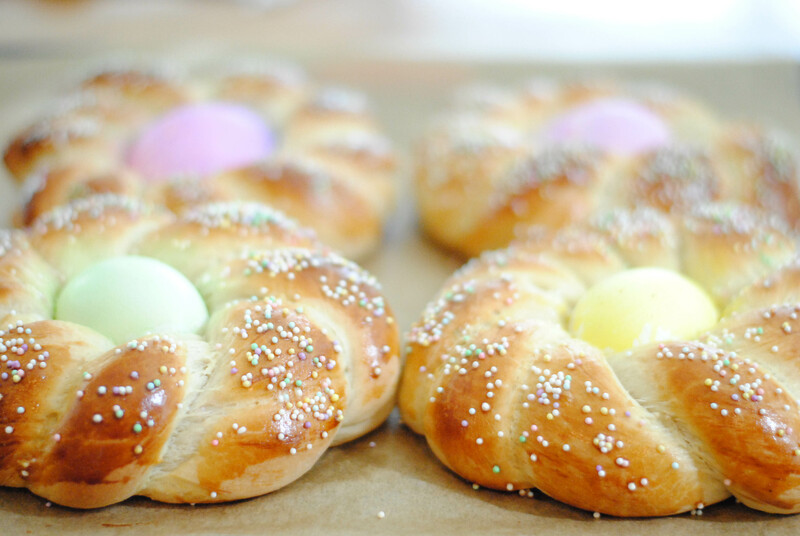 While the eggs and sugar are beating sift the cornflour and baking powder at least 3 times. After 15 minutes add vanilla and beat on high for another 5 minutes. The mixture should have at least tripled in size, be light in color and very foamy. Sift flour mixture over the egg mixture. I like to use a whisk but you can also use a large metal spoon to lightly fold the flour in. Some people like to use a wooden spoon but I find it too heavy. Heavy handling now will result in a flat tough sponge. If you are using butter, thoroughly fold it in now but lightly. 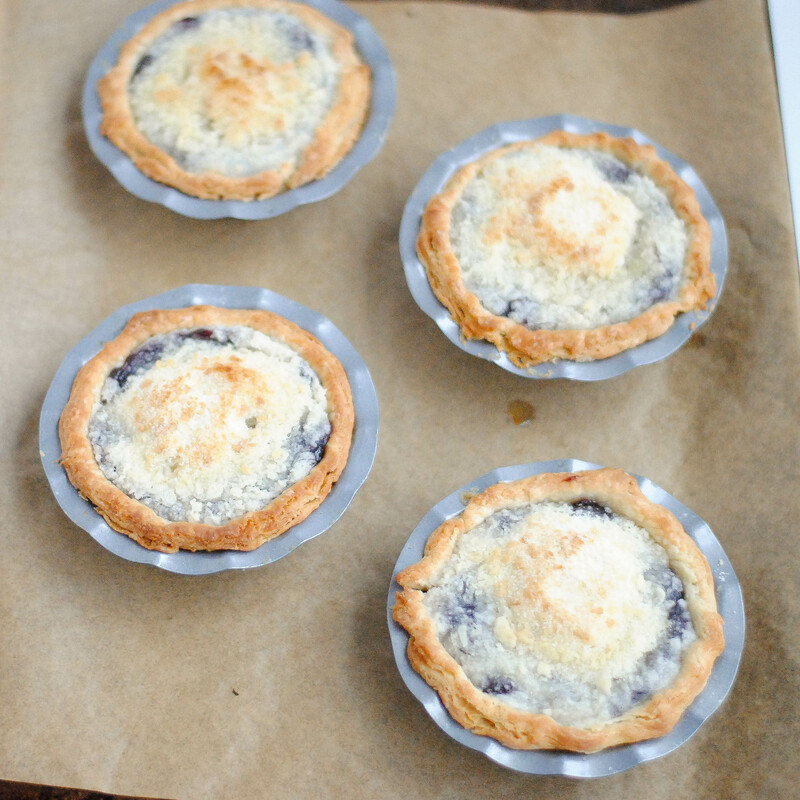 Bake in preheated moderate oven for 22-25 minutes. The sponge will rise quite a lot but then settle back down. Don’t be tempted to open the oven to peak. 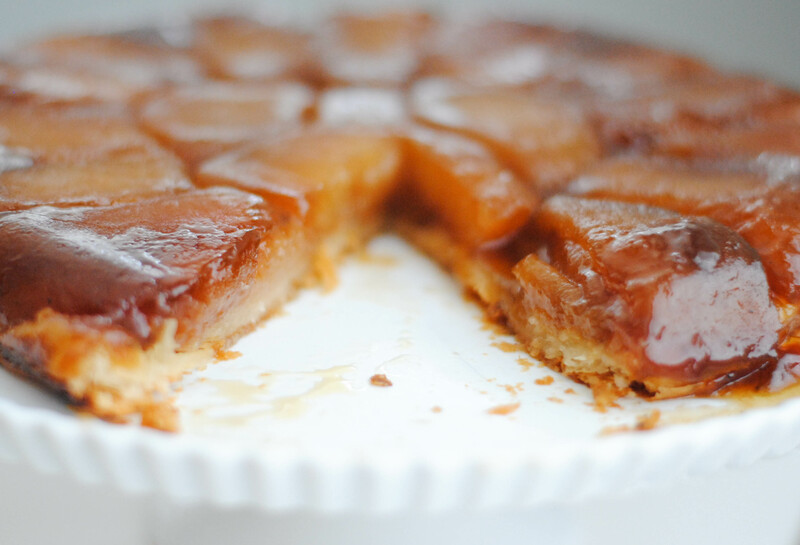 When baked the sponge will have shrunk very slightly from the sides and should feel springy when pressed gently. Turn the sponge out immediately onto a wire rack to cool and reverse sponge so as not to mark the top. Allow to cool. 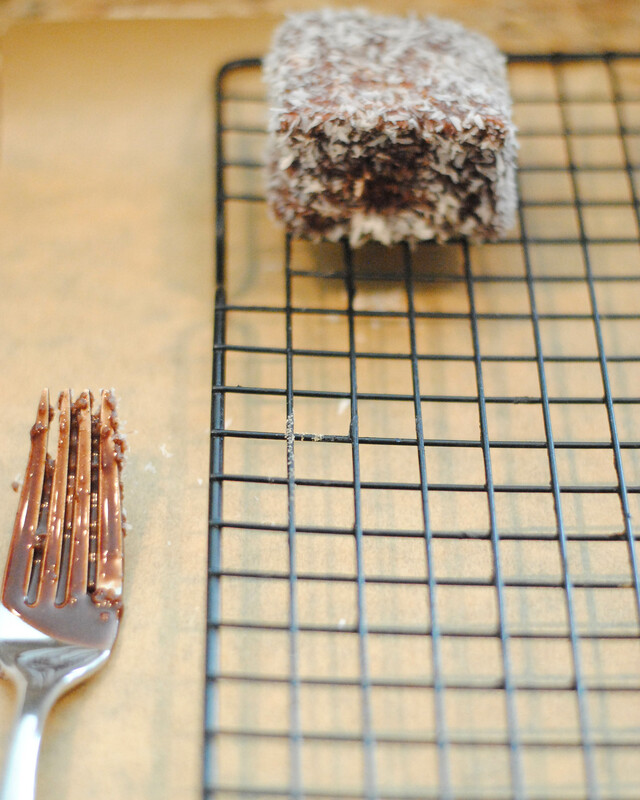 It is best to keep the cake for a day before making the Lamingtons as the cake will be easier to handle. 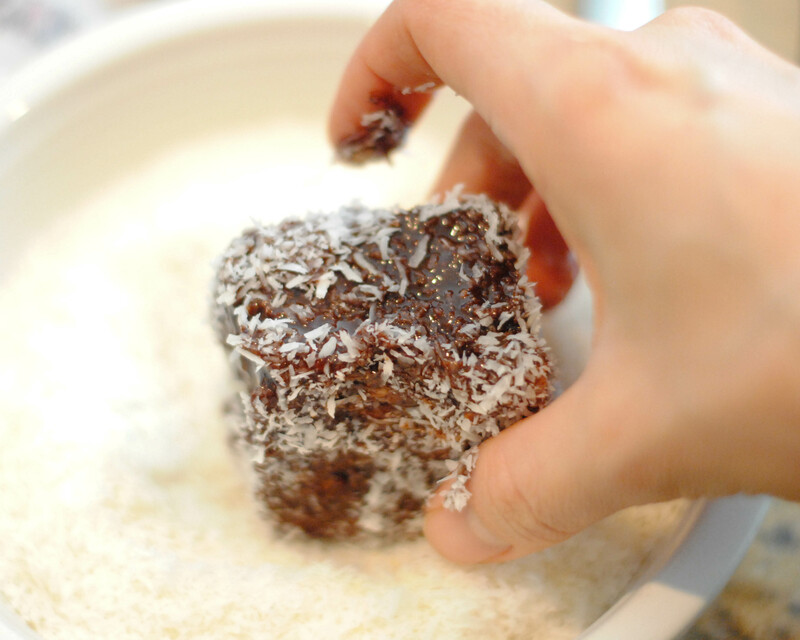 Sift the icing sugar and cocoa into a heatproof bowl. Stir in the butter and ½ cup milk. Set the bowl over a pan of hot water. Stir until icing is smooth adding more milk to thin the icing if needed. I find I need more than ½ cup but not quite ¾ cup of milk. Dip each piece into the chocolate icing, let the excess drip off. 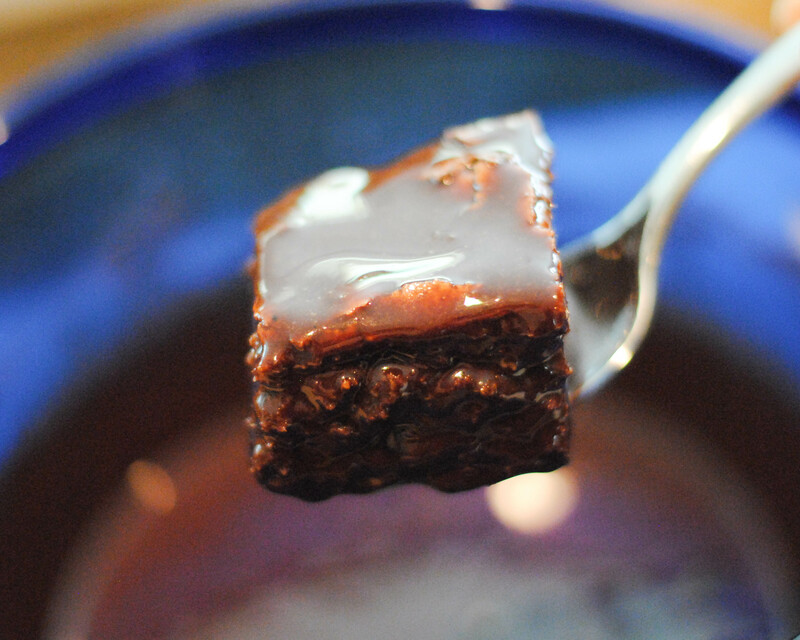 Keep the bowl over the pan of warm water to keep the chocolate smooth. Place on a wire rack and let sit for 2 hours. Refrigerate or freeze. Pretty much every Daring Bakers Challenge I have ever done has been done frantically, a day or two before the posting date. This time was different. Almost 2 weeks ago I made my first herbed focaccia loaf. But I only took a picture of the finished product, and only with my iphone. I told myself I’d make another one and take good photos. I wound up making three more, but didn’t manage to take any good photos. Of any of them. Here is the problem, well problems really. 3 kids under 5, an inability to plan ahead, and the worst, bad light. 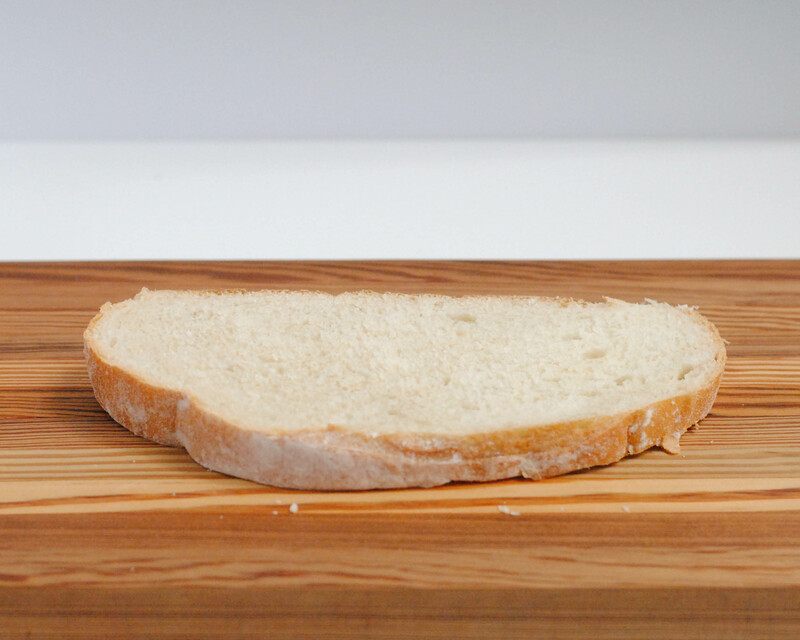 Each time I made bread it was to serve with dinner which meant I was finishing up the bread right about the time the light in my kitchen was blue and my kids were screaming for something. Any of you who have ever been around kids between the hours of 5 and 8pm know exactly what I am talking about. But there is a bright side! 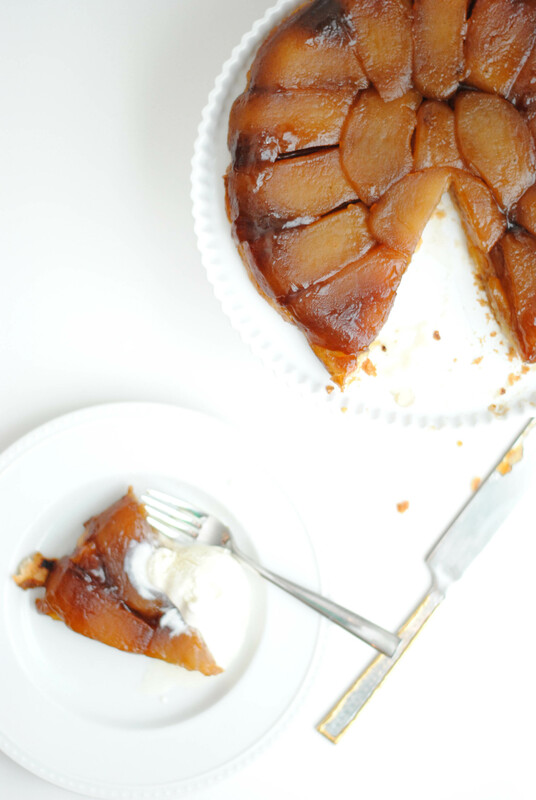 This recipe is wonderful…easy, delicious and with lots of options to make it simple or to add special toppings. The herbed focaccia recipe I made three times. Once sprinkled with salt, olive oil and fresh rosemary, the second time topped with sliced tomatoes, olive oil, salt and rosemary. And most recently I made individual ones with sundried tomatoes and parmesan. My favorite was the second, the one with sliced tomatoes. The sundried tomatoes I added at the beginning of baking and so they got a little too charred. I think you could easily chop them up and add them to the dough for something really great. But the fresh tomatoes won for me. I think maybe because this was the closest one to being pizza! 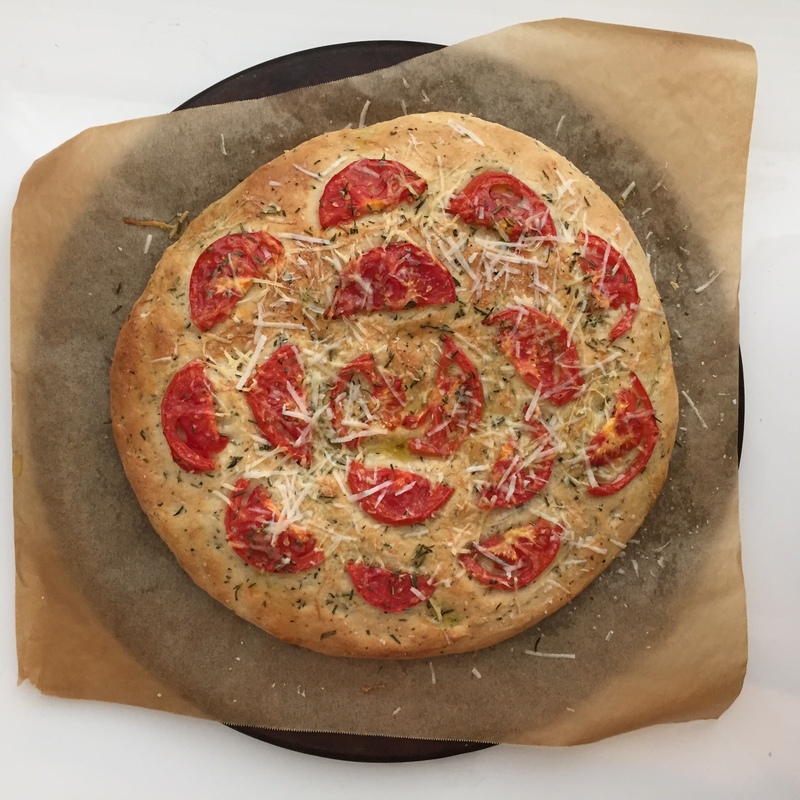 I tried the Focaccia di Recco, but couldn’t find the right cheese, so it wasn’t quite right. 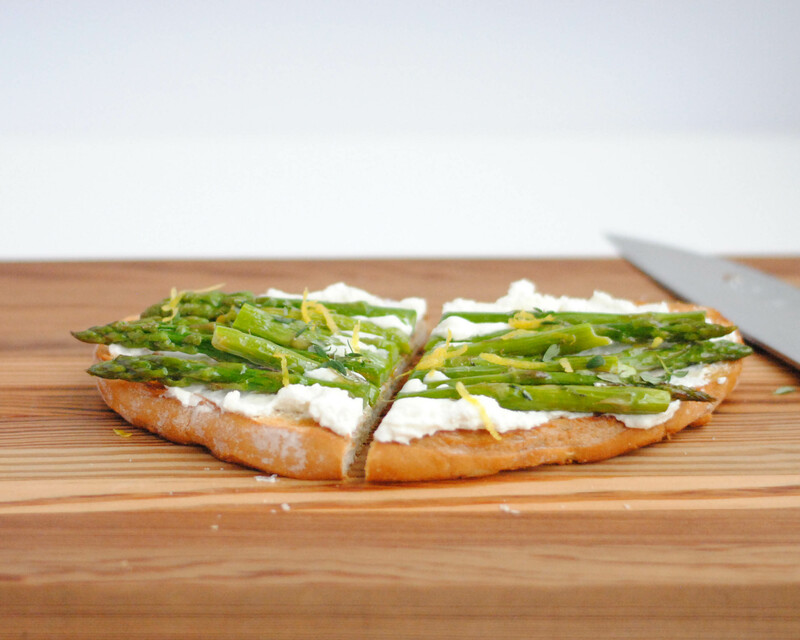 The recipe calls for Stracchino cheese, but I used shredded mozzarella with just OK results. If I ever see it on a menu or in a bakery somewhere I am going to have to try it. It sounds incredible. 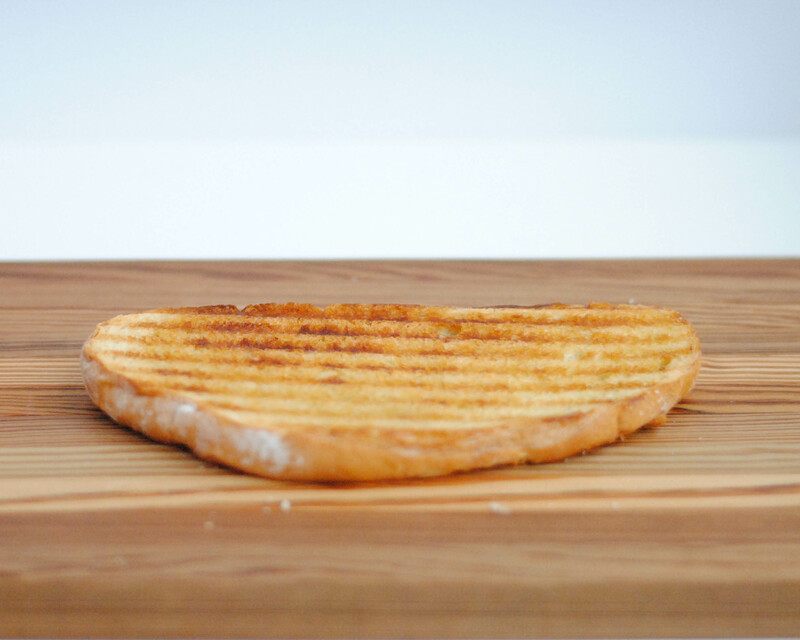 Melty cheese sandwihed between thin layers of dough. Yum. 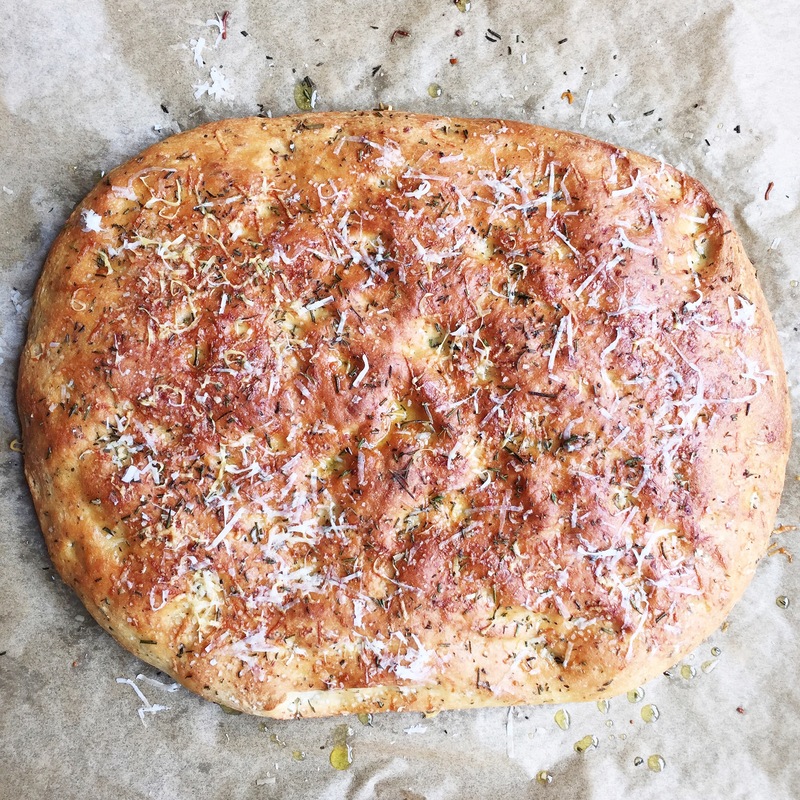 If you’ve ever thought about making focaccia but bought a loaf at the market instead because you thought it was too hard, let me encourage you to try this recipe. You may never go back to store bought! Toppings: fresh rosemary, freshly grated parmesan, sliced tomatoes, olives, sundried tomatoes, onions, etc. Whisk together warm milk, sugar and yeast in a small bowl. Let rest until foamy. In the bowl of a stand mixer combine flour and all the spices. Mix in the cheese, vegetable oil and yeast mixture. 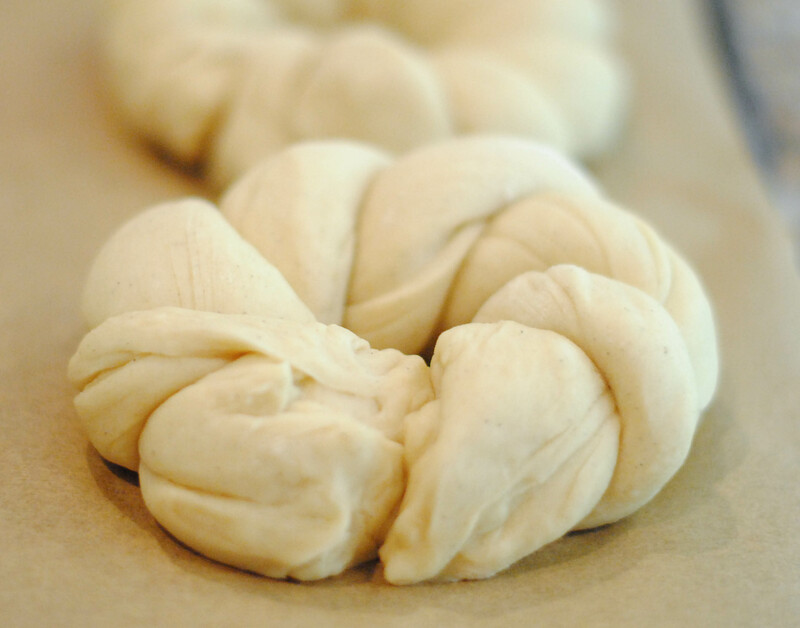 Using a dough hook, mix dough on medium speed for 3-5 minutes until smooth and elastic. 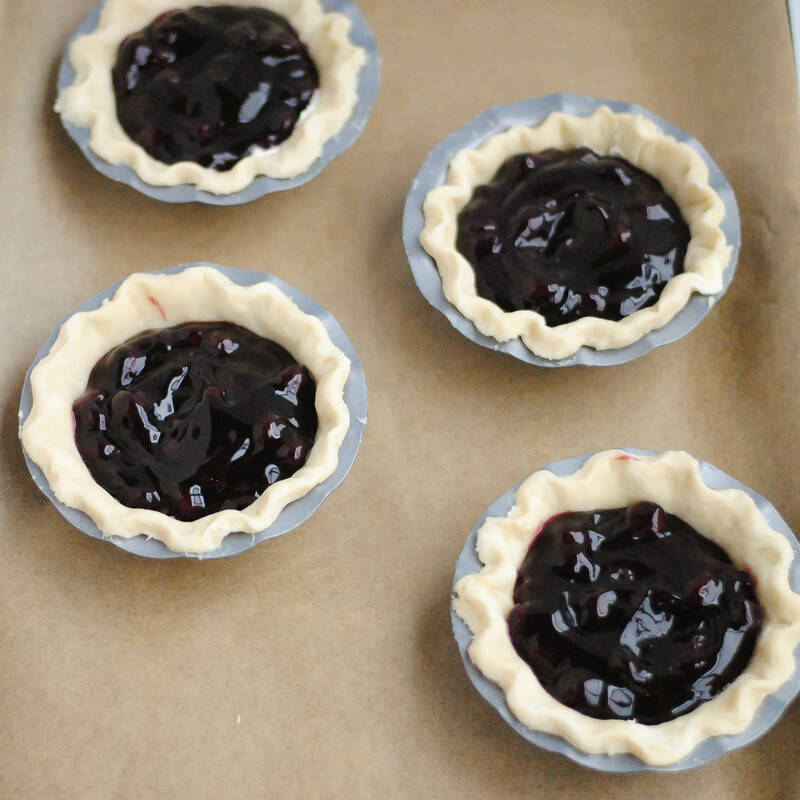 Place in a greased bowl, cover and let rise until doubled in size, between 1 and 2 hours. Preheat oven to 450F. 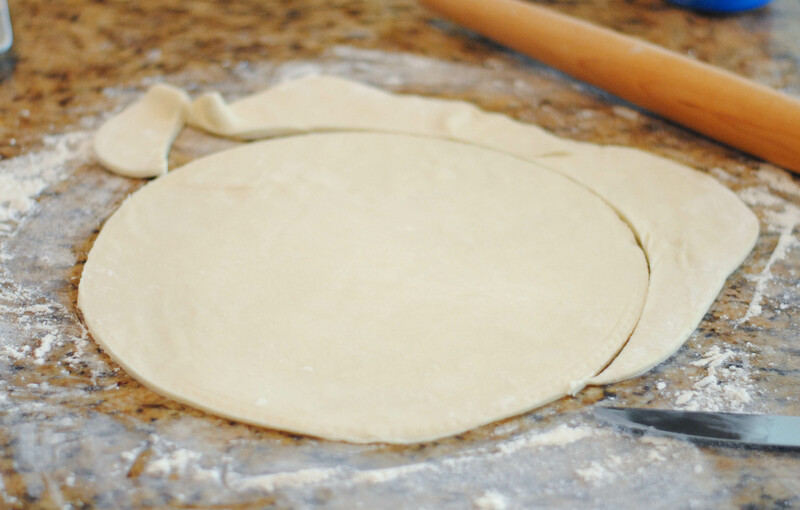 Turn dough out onto a sheet of parchment paper. 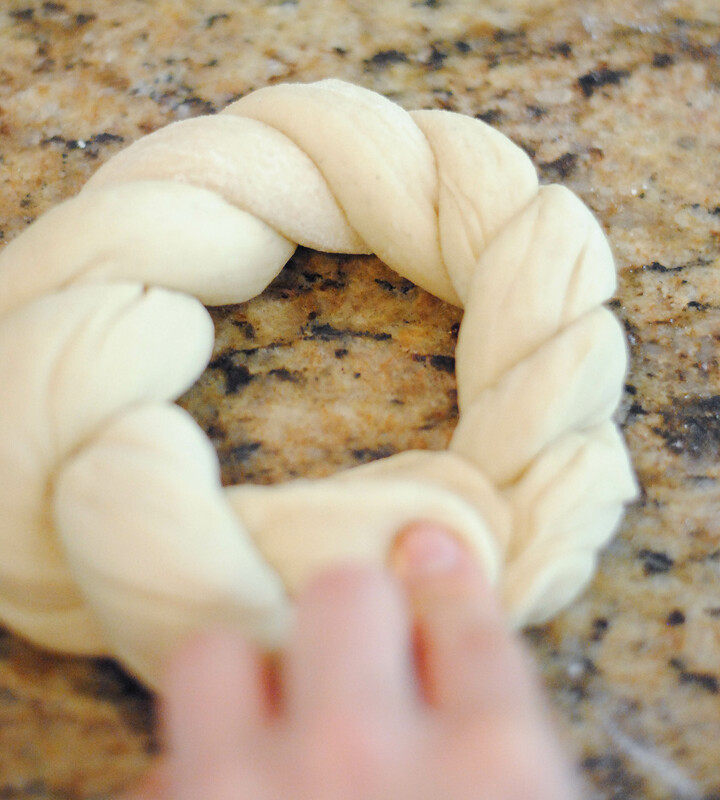 Shape into a rectangle or circle, or divide into 4 circles for individual breads. 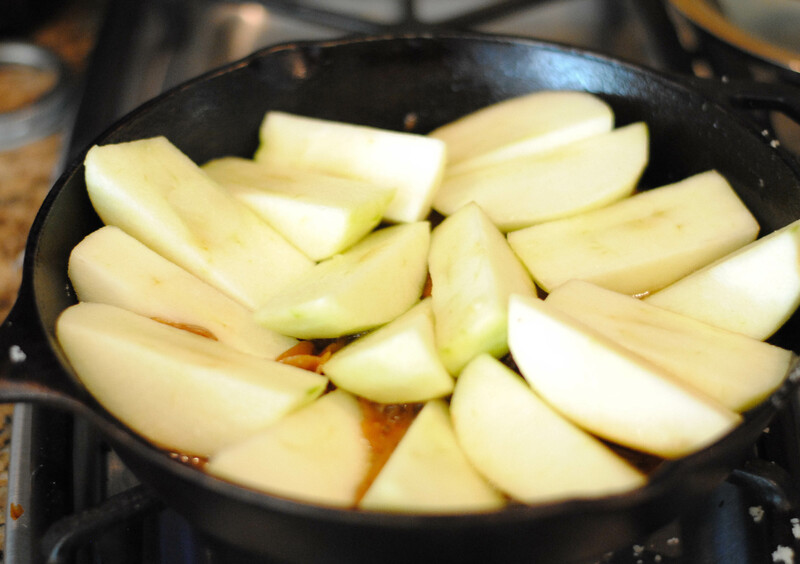 Press all over with your finger tips, then drizzle with olive oil, sprinkle with salt and place toppings. Let rest for 10 minutes. Bake for 15-20 minutes, until golden brown. Drizzle with a bit more oil, sprinkle with more salt if desired and top with some fresh grated Parmesan. Cool for a few minutes before slicing and serving. Over Easter weekend my sister made a breakfast casserole that everyone loved, especially my husband. So when we got back home I decided to make it again as a special weekend breakfast. Instead of making a full batch I halved it and made individual casseroles. You could easily make this batch in an 11×7 or maybe even a deep 8×8. Or you can follow the original recipe and do it in a 9×13. Whichever way you choose you will have a really satisfying and hearty breakfast on your table with very little effort. Of course you can leave out the green chiles, or use more or less than called for depending on how spicy you like things. You can also adjust the cheese and sausage to taste. I found this to be super cheesy, which I love. This combination of mozzarella and sharp cheddar is great, but use what you have or what you like. I used a turkey breakfast sausage, but again, use what you like. I love dishes like this that are very forgiving and easily adapted. 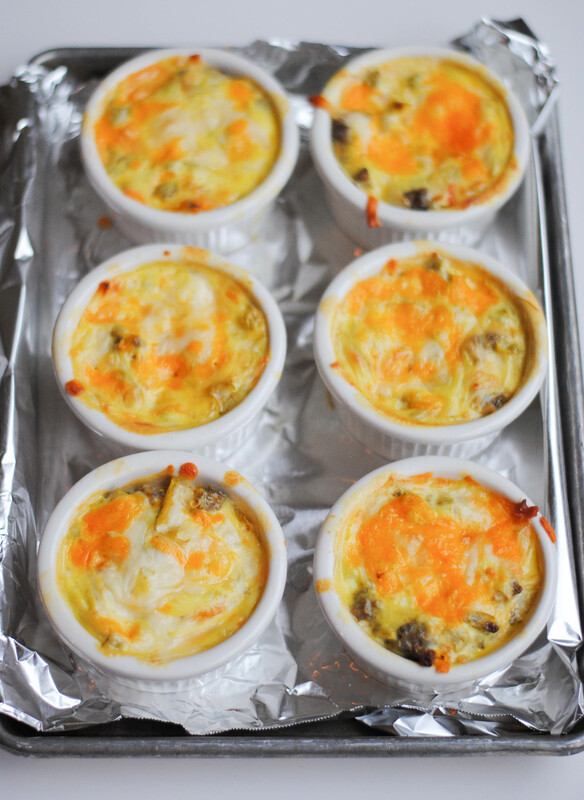 This makes 8-10 individual casseroles depending on the size of your ramekins. 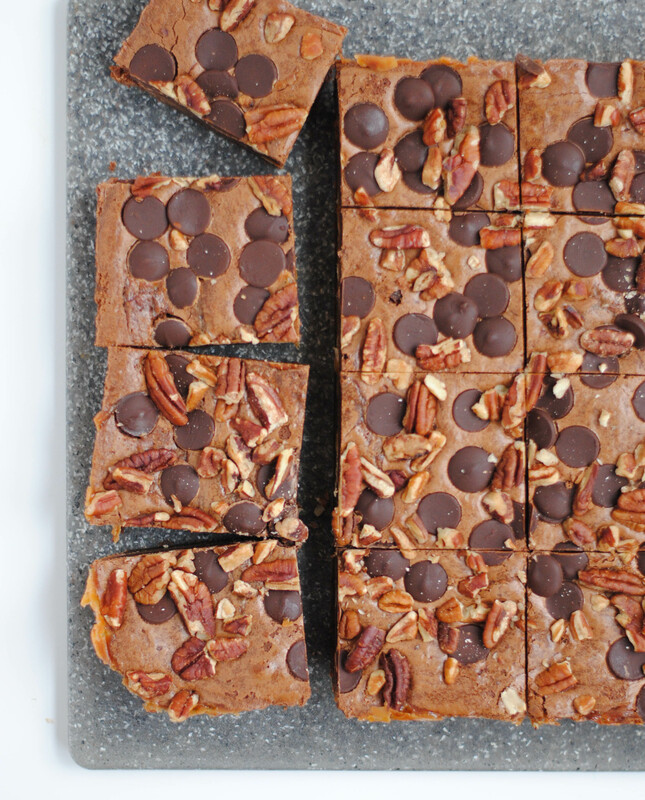 Be sure to bake them on a rimmed baking sheet just in case they spill. Mine did not, but better safe than sorry. The measurements and instructions below might frustrate you if you thrive on precision in the kitchen. Since this was my first time making this and I was working from measurements for a larger dish I had to adjust as I worked. I started off with 4 eggs and 3/4 cup of sour cream and as I was filling up the dishes I realized I was not going to have enough, so I whisked in another egg and a bit more sour cream. I included that adjustment in the recipe. 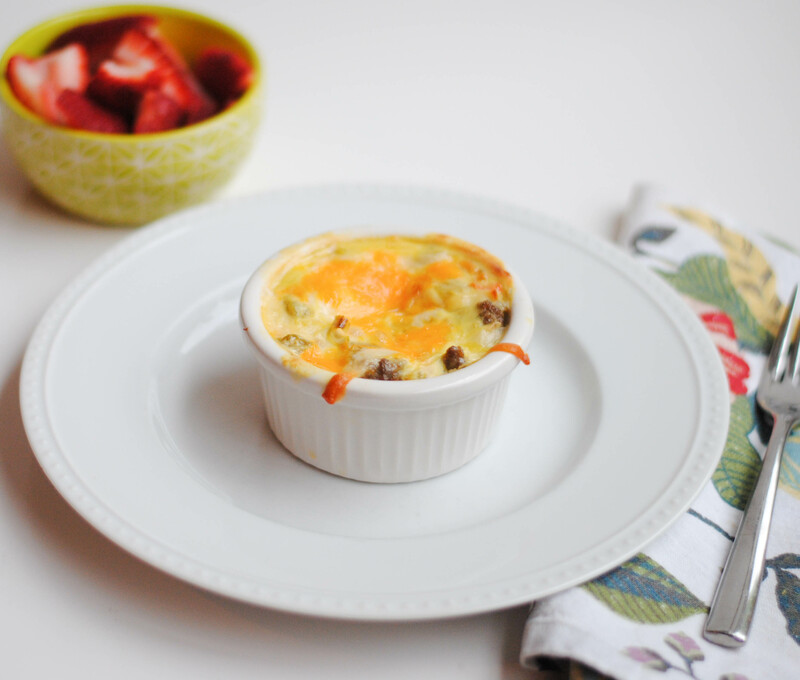 But since we likely do not have the same ramekins, your definition of “a sprinkle” is different than mine, and I may tend to be heavy-handed when is comes to sausage you may find that you have too much or maybe that you didn’t have quite enough of something. I wrote the ingredient list with the motto, “Better too much than not enough” but please let me know if you found any ingredient to be way off. 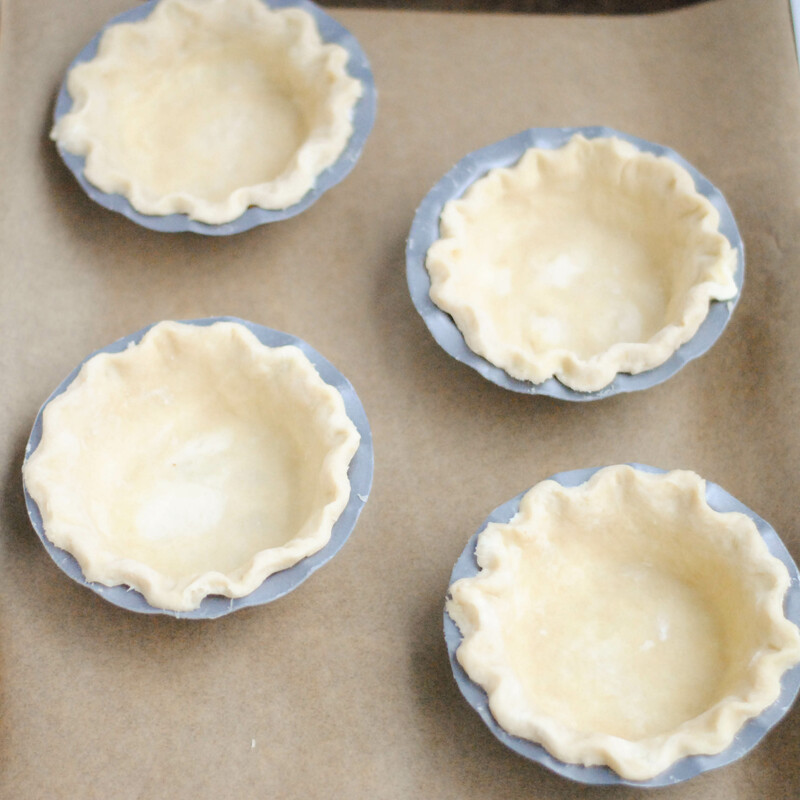 Spray ramekins with cooking spray and arrange on a rimmed baking sheet lined with a dish towel (this will keep them from sliding around). Butter the inside of each halved english muffin and then cut each half into about 12 chunks. Add enough chunks to just about cover the bottom of the ramekin, for me this was about 6. Squish them in there so they make a nice layer, but err on the side of too few since they will expand once they soak up the egg mixture. Repeat with all of the ramekins. Whisk together the eggs, sour cream and green chiles and set aside. 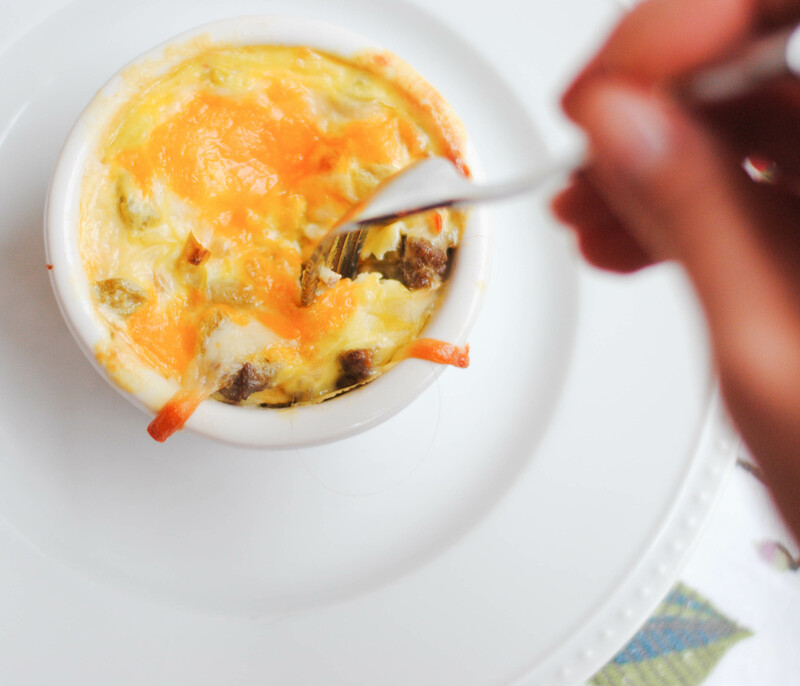 Divide the sausage between the dishes, sprinkle generously with a little of both cheeses (leave a little extra), then pour some egg mixture on top. Pour just enough of the egg mixture to reach the top of the dish. Sprinkle with a little more cheese. Repeat with all the dishes. Cover the entire pan with a sheet of foil and move (carefully) to the fridge to sit for 8-12 hours. Preheat oven to 350°F. 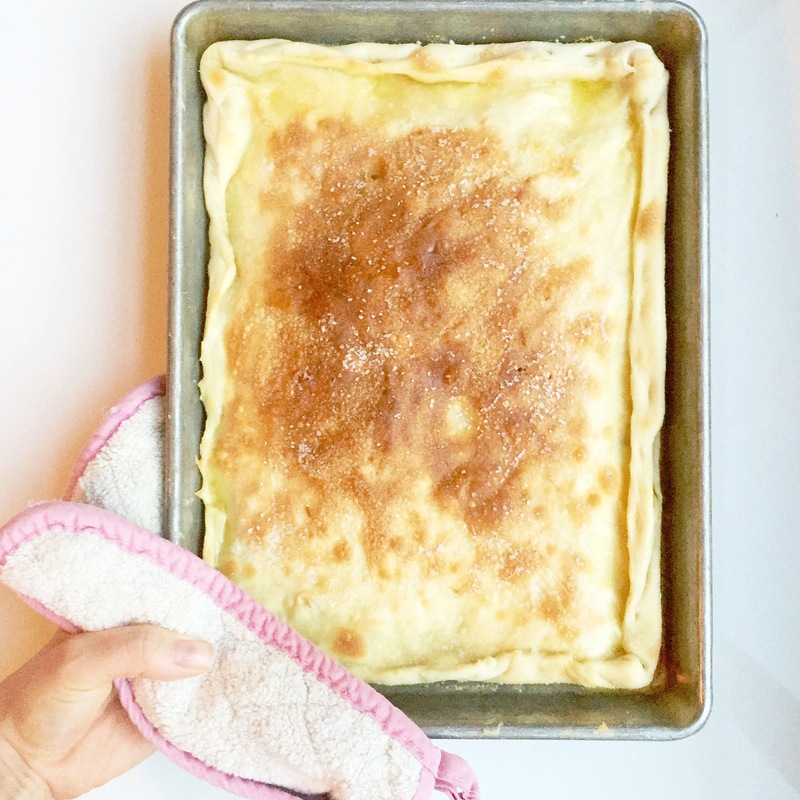 Remove the dish towel from the baking sheet, line with foil and arrange ramekins back on the pan. 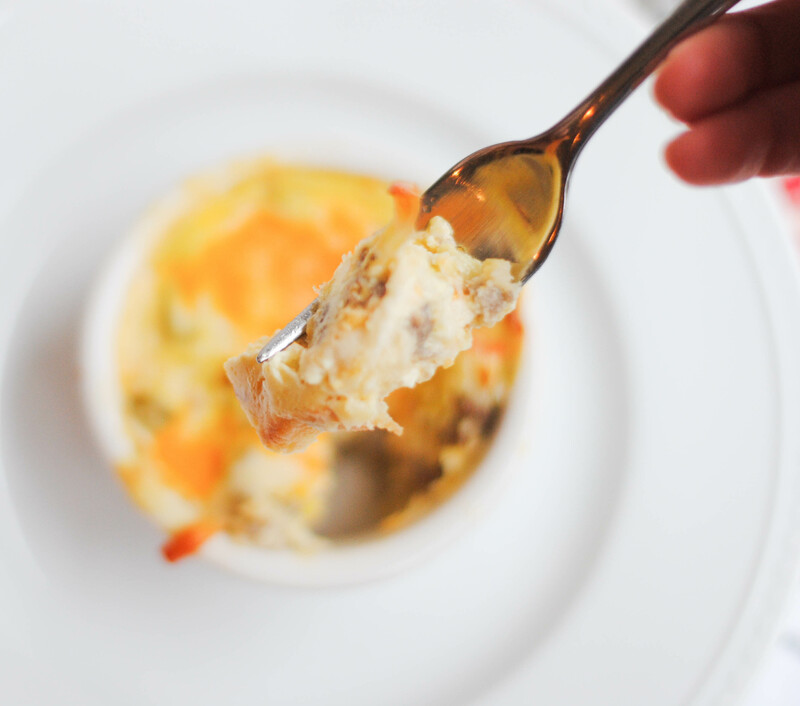 Bake for 25-30 minutes, until cheese begins to brown and there’s just a slight jiggle to the egg. Let sit for 10 minutes before serving. Right now as I write this post I am snacking on some of this bread warm from the toaster with my afternoon coffee. It’s such a treat and I want you to experience the same pleasure. 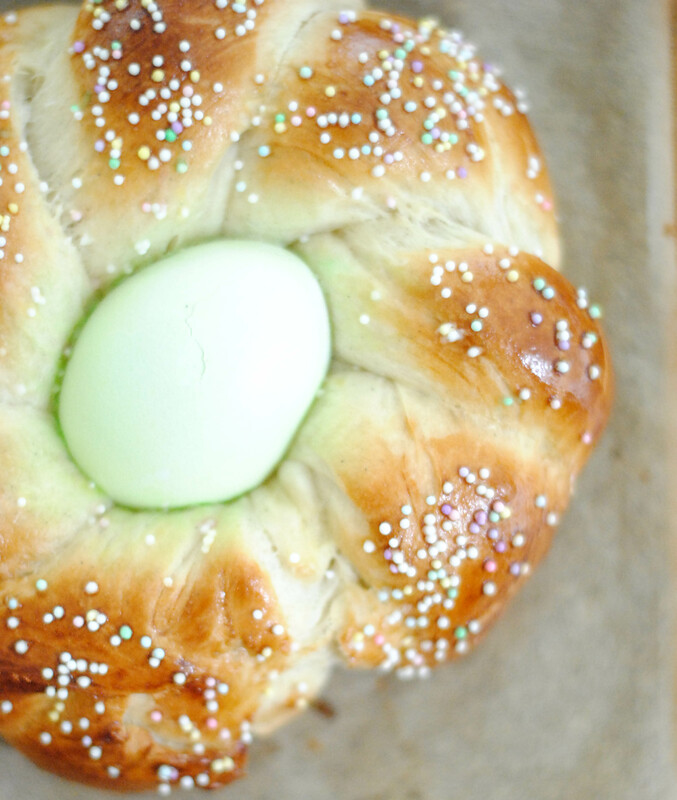 So do yourself a favor and go make this bread for the weekend! Sometimes I hit a wall when I’m writing a blog post. I am having that experience now with this post. Big time. My mind is just a big foggy mess and when I sit down at the computer my hands freeze. For some reason I feel like I should have something to say other than, “I made this. It was delicious. Here is the recipe.” But that’s all I have! Hope you all have a very Happy Easter celebrating the resurrection of Jesus Christ! 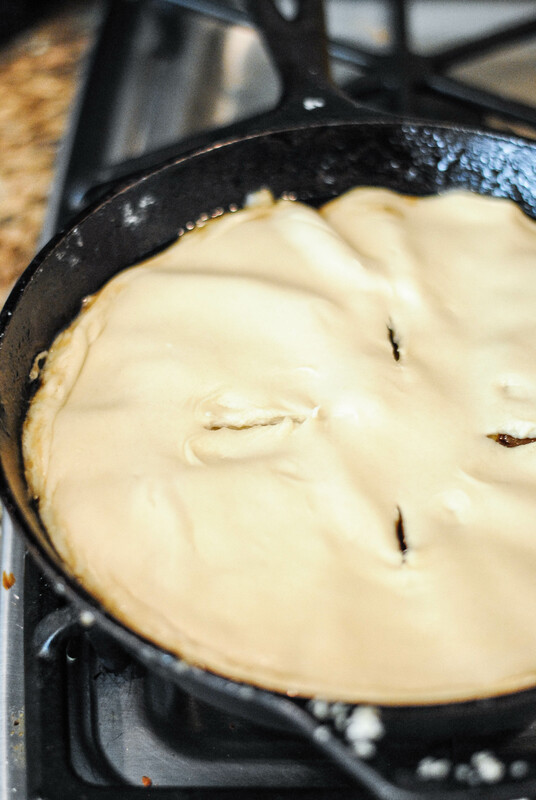 Heat milk over medium-low heat until bubbles form on the edges of the pan and the milk is steaming. Turn off the heat. Stir in melted butter, sugar, salt, ground cardamom and nutmeg. Let mixture cool until lukewarm, 100-110°F. Stir in the yeast and let sit for about 10 minutes until foamy. Pour mixture into the bowl of a stand mixer. 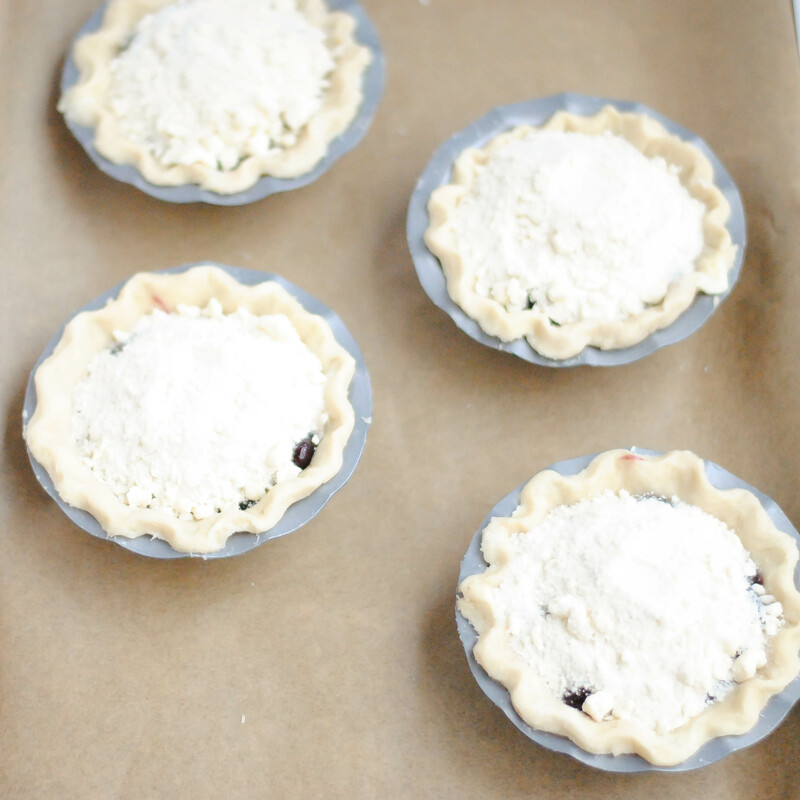 Add 2 cups of flour and mix on low with the dough hook until flour is mixed in. Add 2 more cups, mix, and repeat until you’ve added 8 cups total. Turn the mixer up to medium and mix for 3-4 minutes. 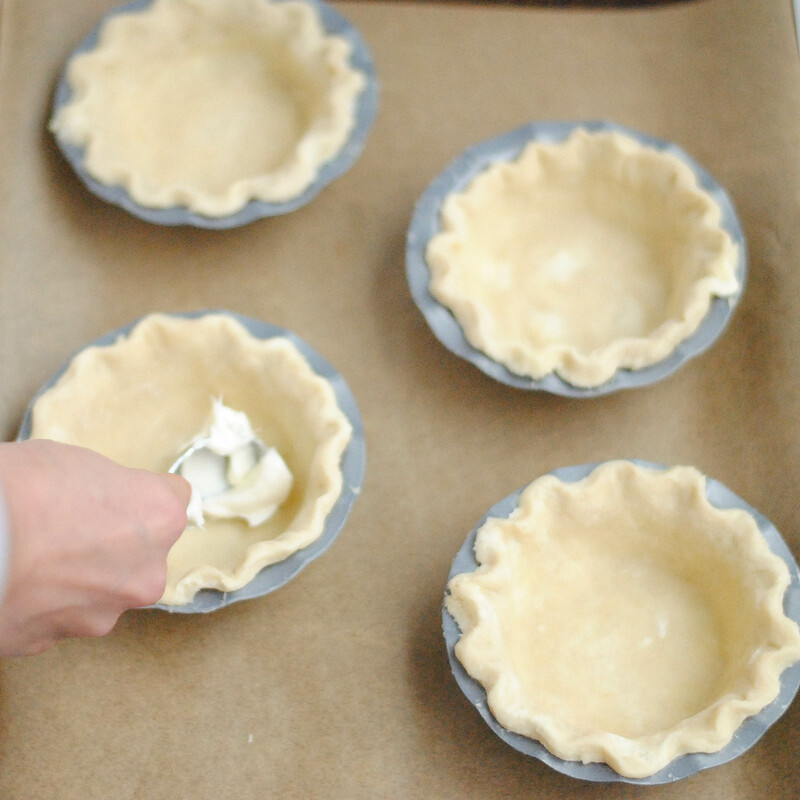 If the dough does not pull away from the sides of the bowl add more flour, 1/4 cup at a time, until it does. Turn dough out onto a floured surface and knead a bit, then place in an oiled bowl, cover with plastic wrap and let rise until doubled, about an hour. 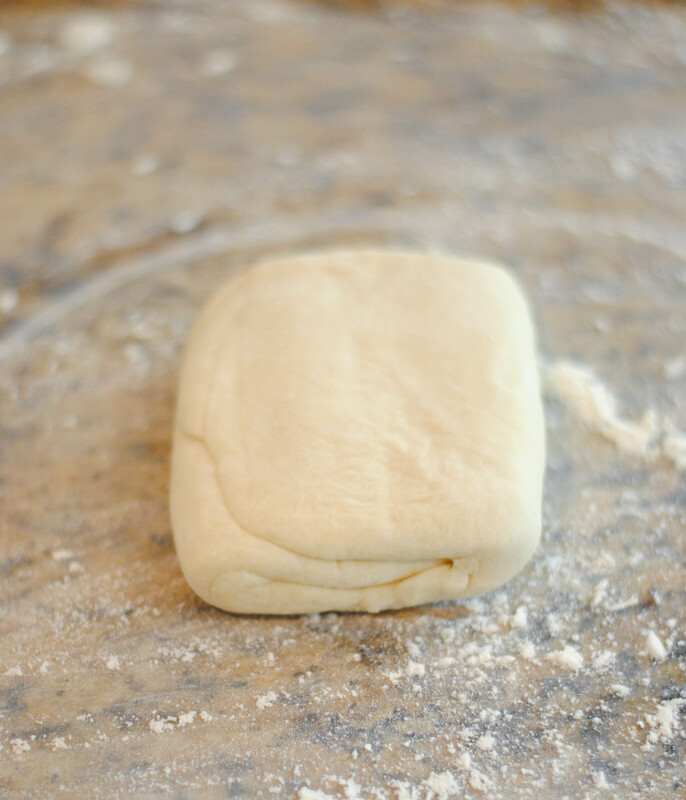 Punch dough down and place on a floured surface. Divide in half. 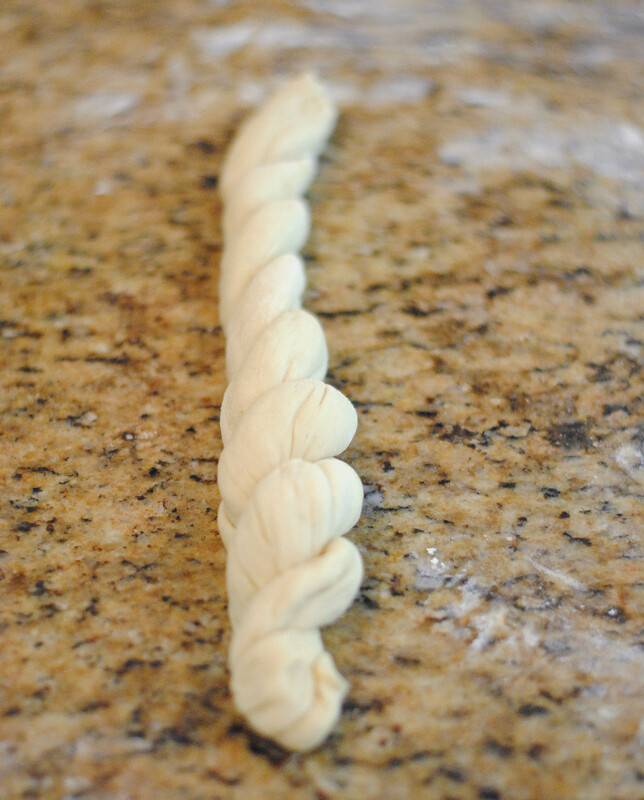 For Bread: Divide a half into thirds and roll each third into a rope about 14 inches long. Pinch ends together and then braid the ropes together, pinch the ends together and tuck the ends under. 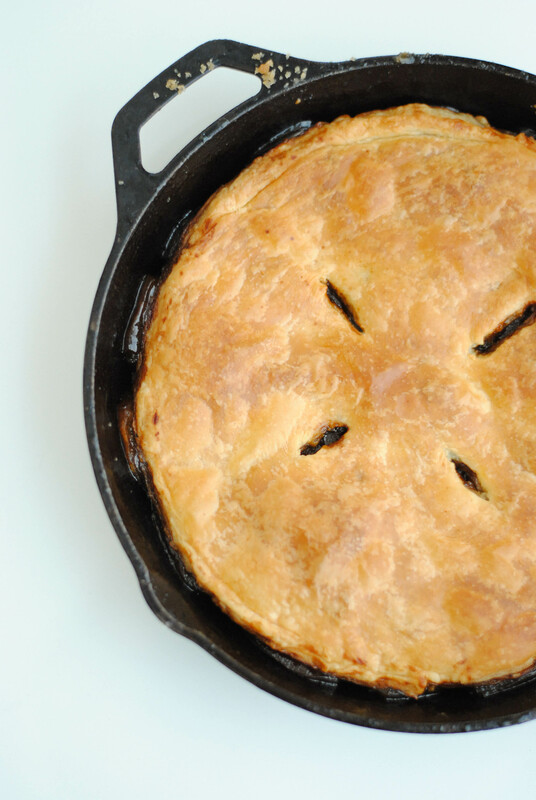 Place on a parchment lined baking sheet, cover and let rise for an hour. 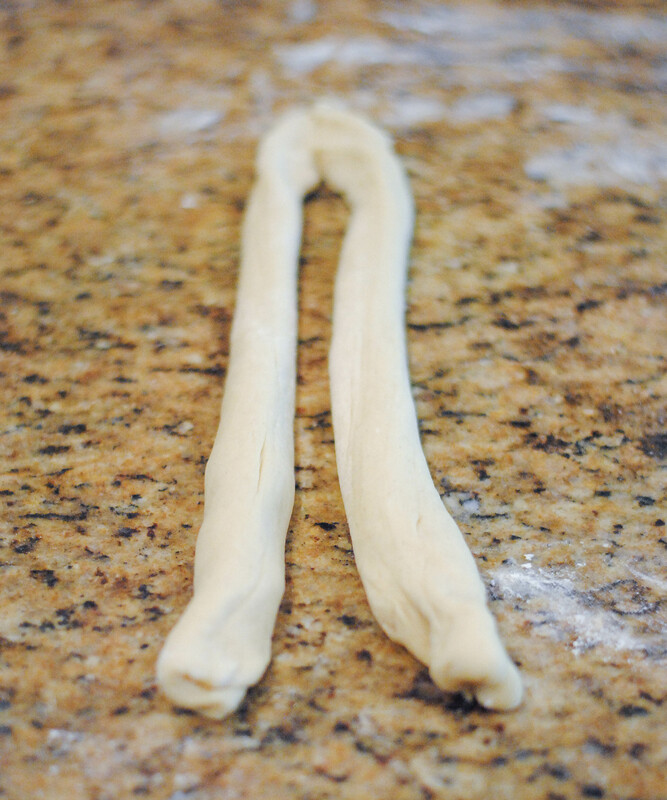 For Buns: Divide the half into 4 pieces, then each piece in half. Take those pieces and roll them into ropes about 10 inches long. Pinch the ends together and twist the pieces together, then pinch the ends and connect the ends by pinching them together. Repeat with the rest and place all 4 buns on a parchment lined baking sheet, cover and let rise for about an hour. Preheat oven to 375°F. 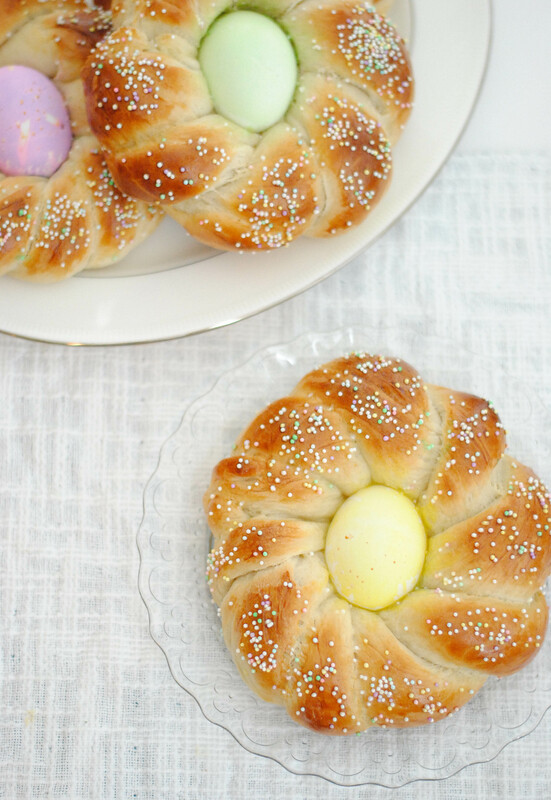 Beat an egg and brush onto buns or loaves. Sprinkle with colored sprinkles if desired. 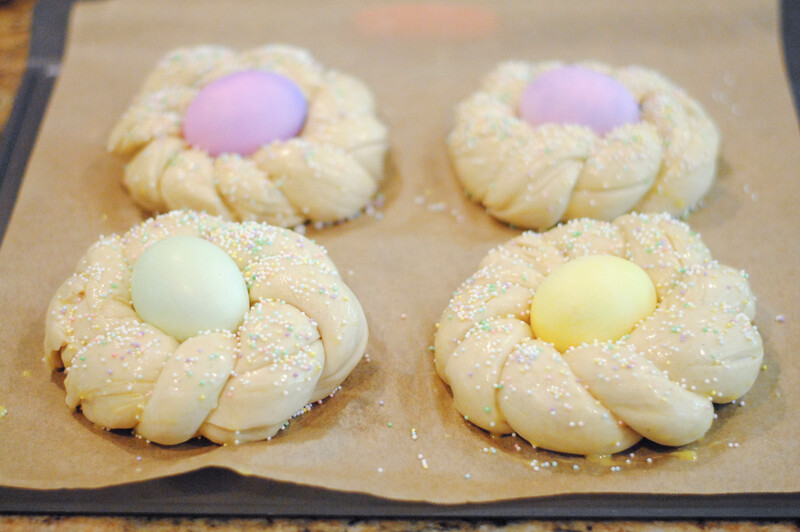 Place egg in the center of each bun. Bake for 20-25 minutes for buns and 25-30 minutes for bread. I’ve made this salad twice now. It’s so delicious. These pictures don’t do it justice, but trust me. Yum! It’s a great change of pace from the typical spring mix salad that graces out table most nights. 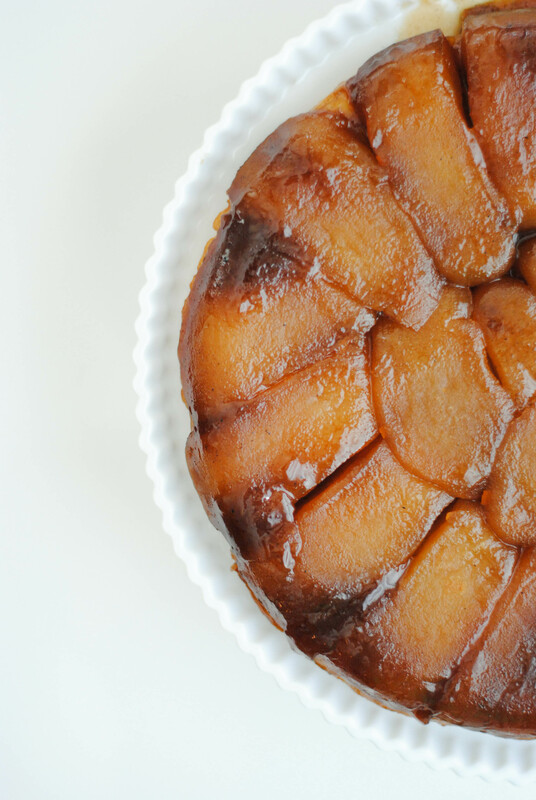 Many side items can be made in advance, but this one requires you to make it ahead of time! This is great for me. I do a lot of dinner prep (or at least I try to) during nap time, and having part of the meal totally completed early in the day puts a little spring in my step. It’s the little things, you guys! The first time I made this I used pistachios and cherries, and this last time I used pine nuts and cherries. Both variations were great, just depends on what you have and what you like. 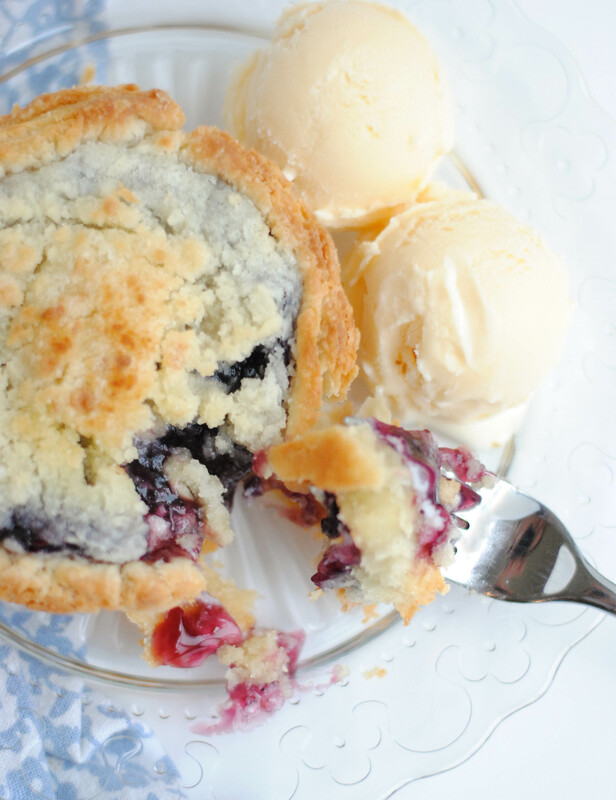 You could easily leave out the nuts, use something else, and even replace the cherries with cranberries. I wouldn’t use anything other than the parmesan, though. 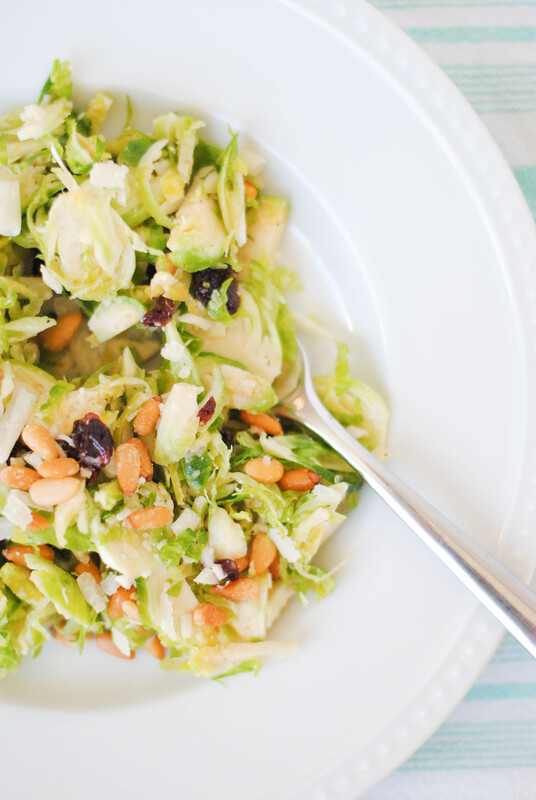 The flavor is perfect with the brussels and it has a great texture that other cheeses lack. Any hard cheese will do. Make sure to grate it on the large holes of your grater. 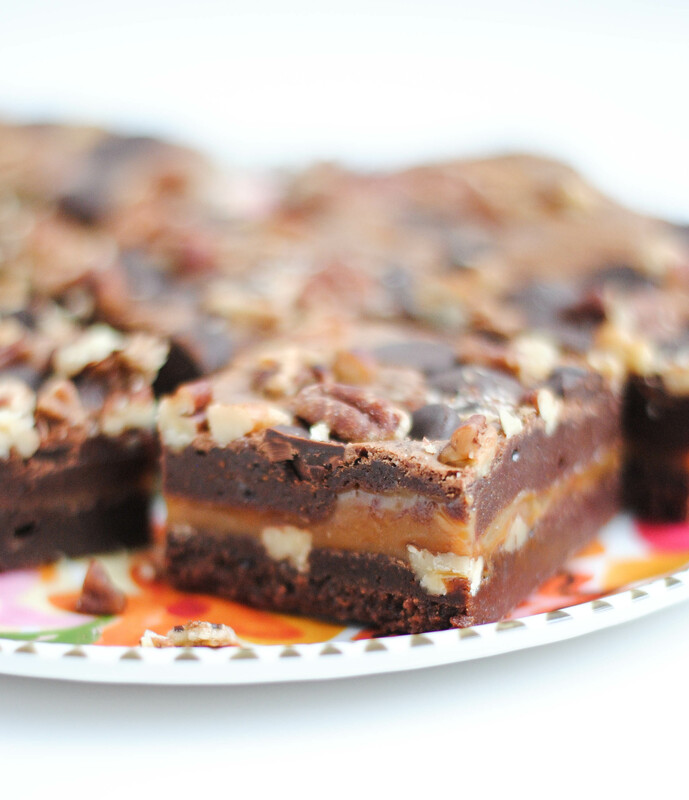 The recipe is from a Test Kitchen Best of 2015 magazine I picked up at the grocery store. The original recipe feeds 8, so I cut it in half. While I could sit and eat the entire bowl of this by myself, it will feed 4 as a side dish. The first time around my husband and I ate it as a side 2 nights in a row. This last time I made it I ate it for lunch a couple days. You need to let the salad marinate for a few hours so that the brussels soften a bit. It is best the day it’s made, but this will last for a couple days in the fridge. Take the time to thinly slice the brussels. Put some good music on or put something good on tv (may I suggest the Unbreakable Kimmy Schmidt?!) and get to work with your paring knife. Sometimes tedious work like this is therapeutic for me. Other than that, there isn’t too much work to be done. I made the dressing in a mini food processor, eliminating the need to finely chop the shallot and garlic. 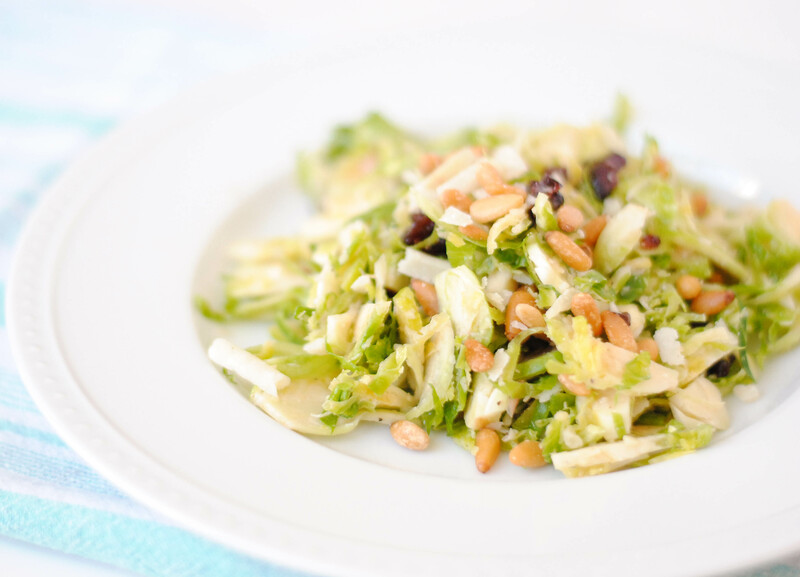 This is a great spring salad with lots of ways to make it your own. Enjoy! In a mini food processor combine garlic and shallot and finely chop. Add in the lemon juice, mustard and olive oil and pulse a few times. Season with salt and pepper. 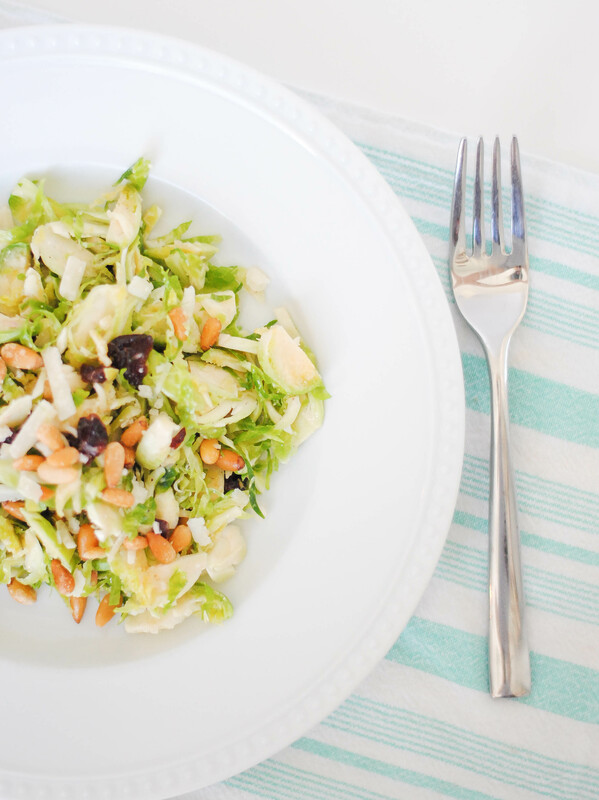 In a large bowl toss the Brussels with the dressing, cover and refrigerate for at least an hour. Before serving toss in the pine nuts, cherries and Parmesan. 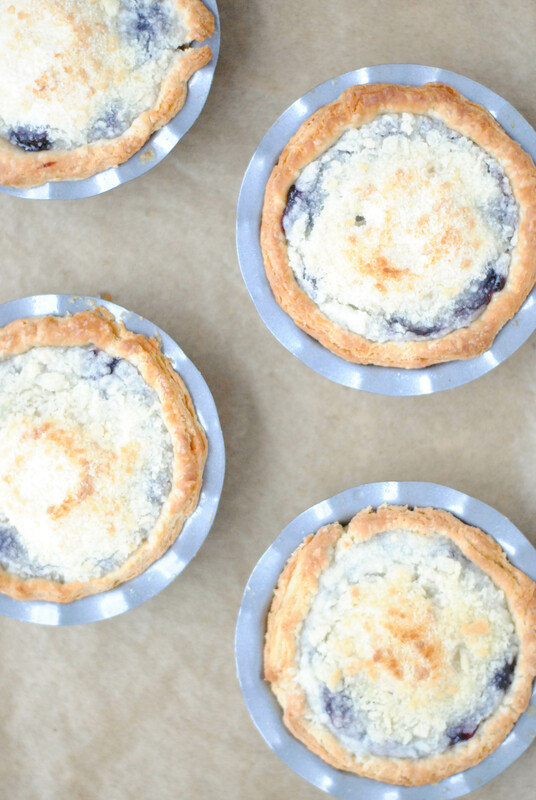 Sometimes you just need to bake something. Maybe the weather is dreary, you’ve had a bad day, or, if you’re anything like me, you just need a project that has a beginning and an end and tangible (and edible!) results because no other task you’ve attempted that day has been successfully completed. 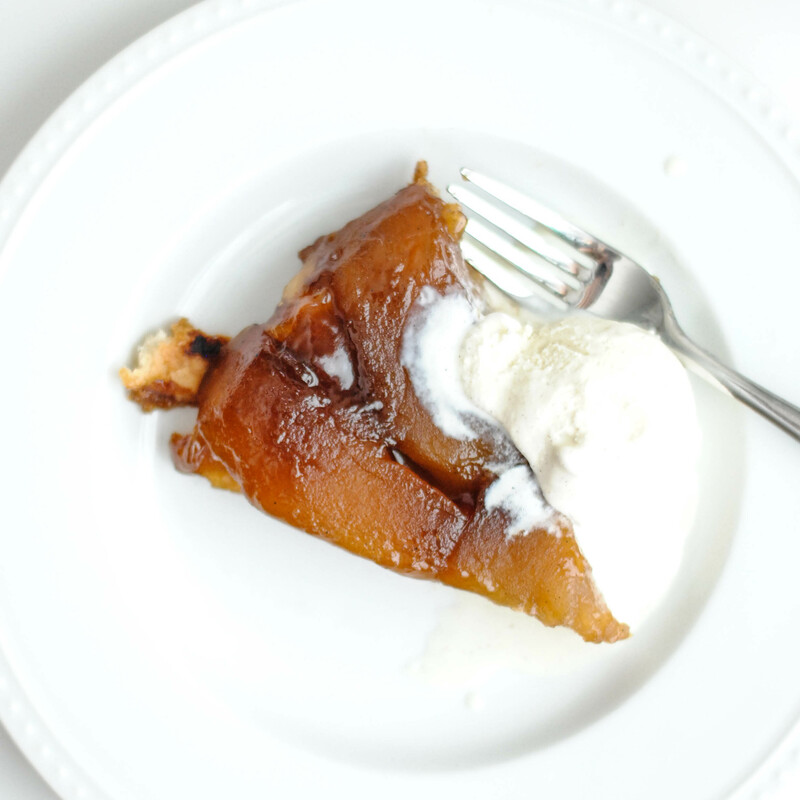 You want something quick with very little prep and a short bake time so that you don’t have to wait long to enjoy the fruits of your labor. 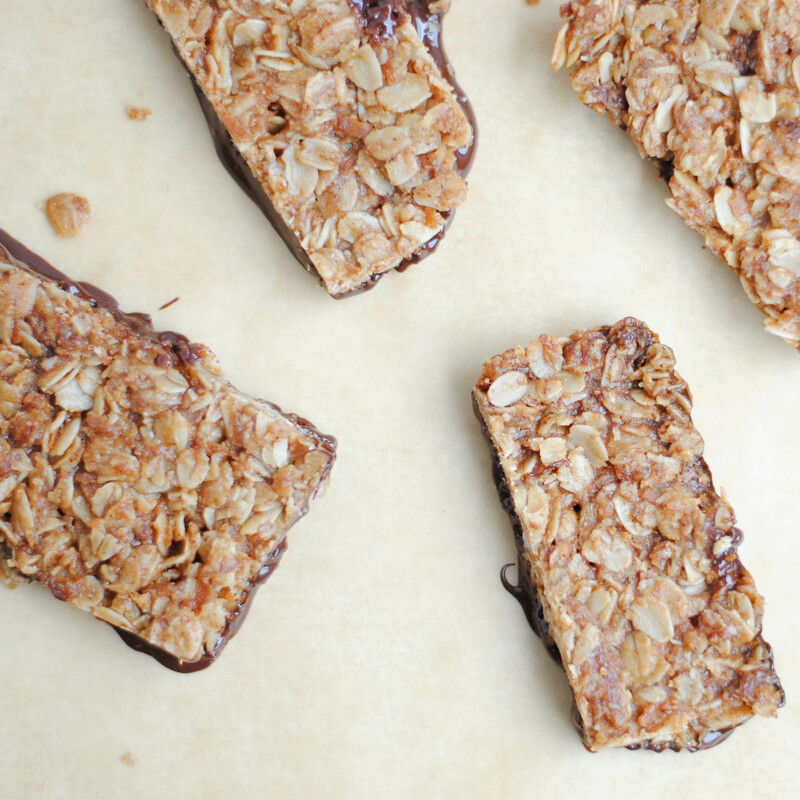 These oatmeal bars meet every one of those qualifications AND they’re delicious. They remind me a lot of the oat and honey Nature Valley bars. 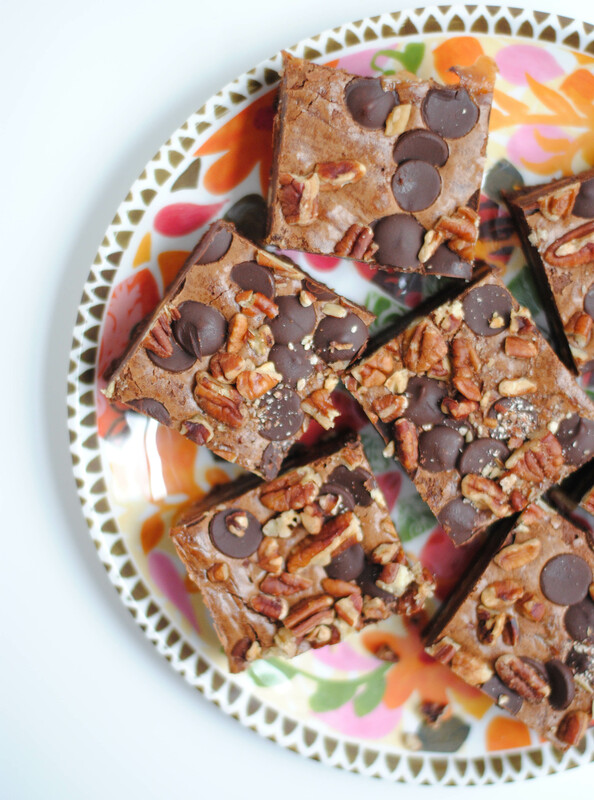 Drizzle on some melted chocolate chips to make them a bit fancier, but they are really good just on their own. 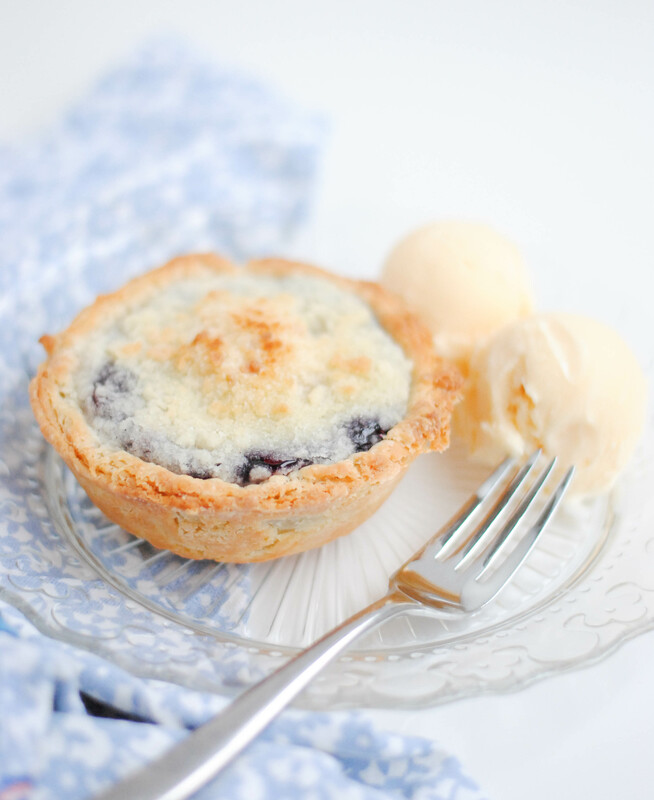 This recipe is from a cookbook I have baked from a lot, but it’s been a while, Rebecca Rather’s Pastry Queen. 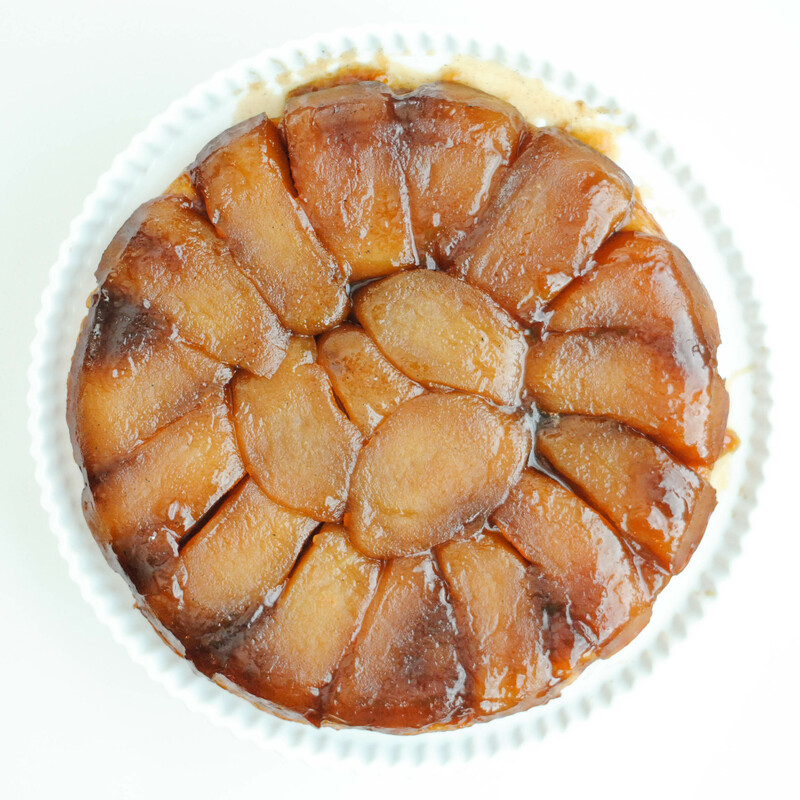 It is one of my favorite dessert cookbooks. Most of you probably scrounge around on the internet for recipes, like I do. But then you browse an old cookbook and find a real gem and you tell yourself you’ll do it more often. But you somehow find yourself going back to the computer or pinterest the next time. 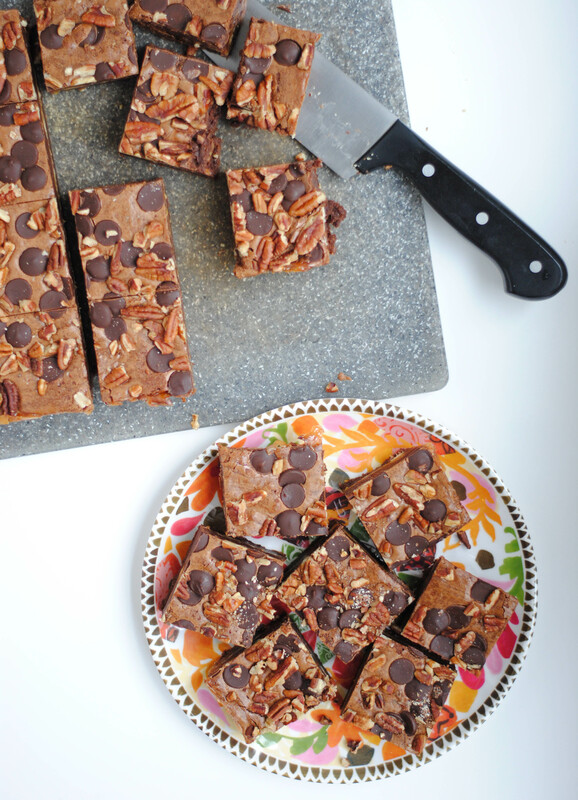 I urge you to go to your cookbooks! I have so many of them, some I have never even cooked from. And that’s a shame. I vow to do more cooking from physical cookbooks. You should join me. Back to the bars. Preheat oven to 350°F and grease a 9×13 pan. 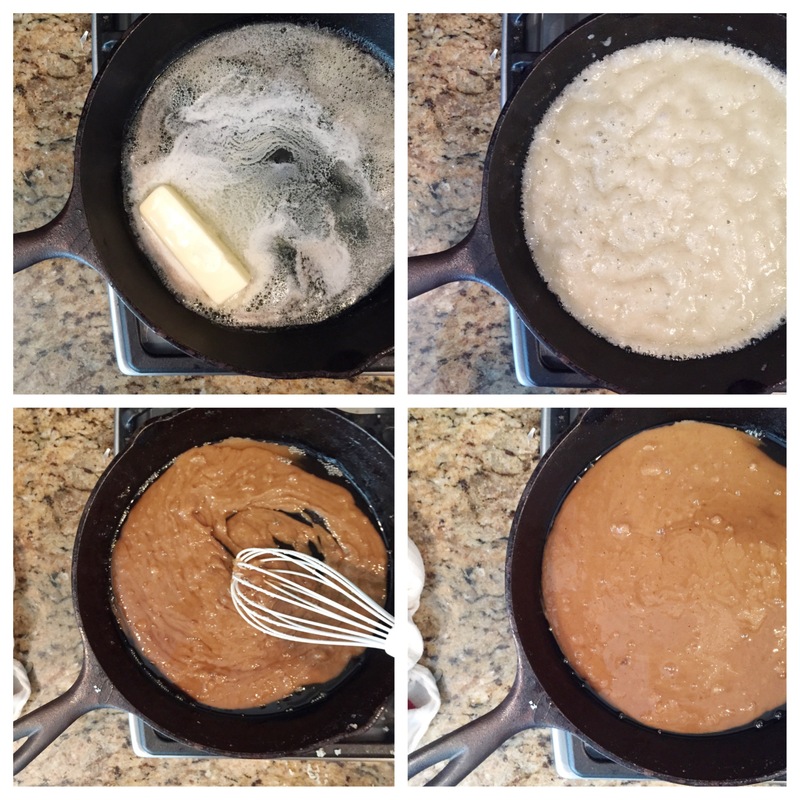 Melt butter, brown sugar and corn syrup over medium heat. Stir until sugar dissolves, 1 to 2 minutes. Remove from the heat. 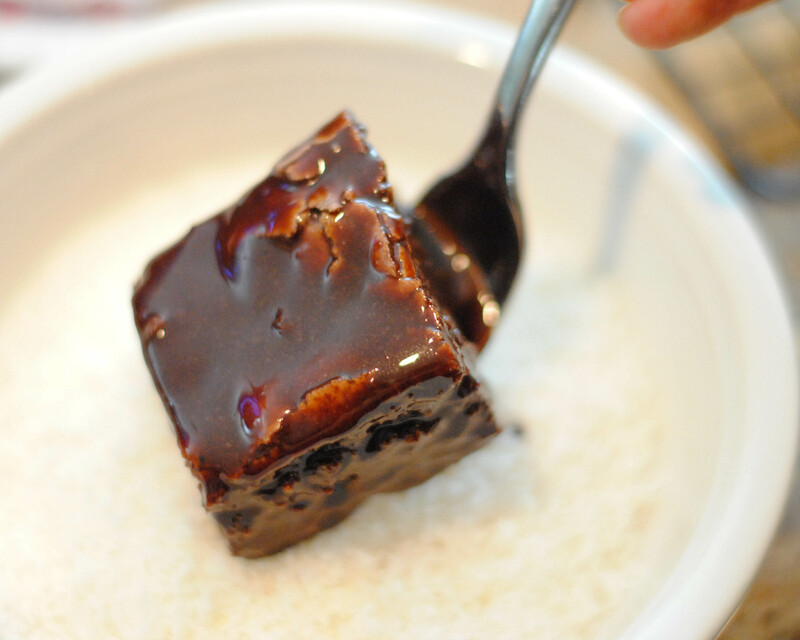 In a large bowl stir together oats, baking powder, salt, cinnamon and coconut. Pour melted butter over and stir to combine thoroughly. Press firmly into the prepared pan and bake for 20-25 minutes. Cool for 20 minutes before cutting into bars. 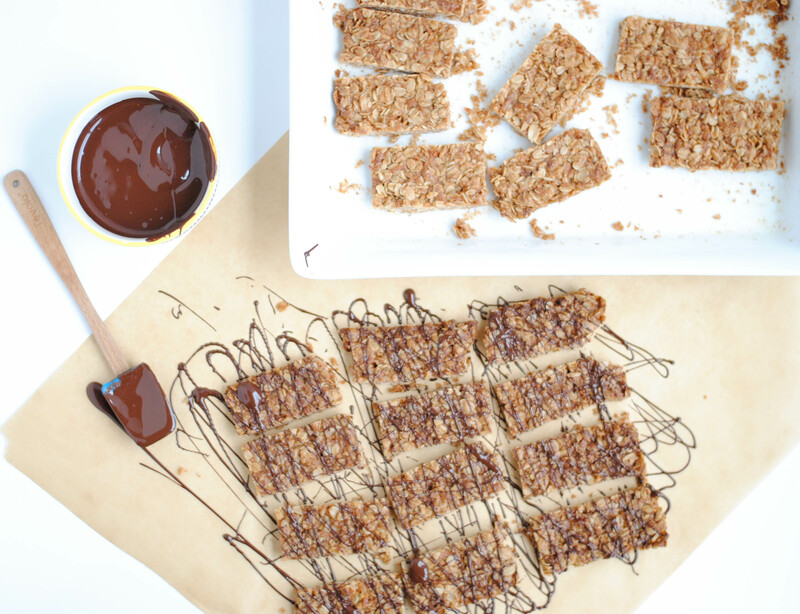 Melt chocolate and drizzle over bars or dip them.